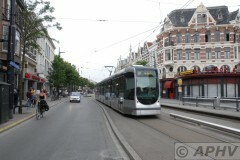 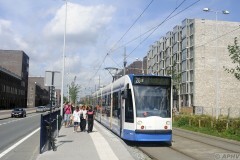 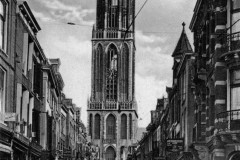 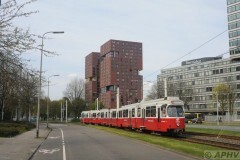 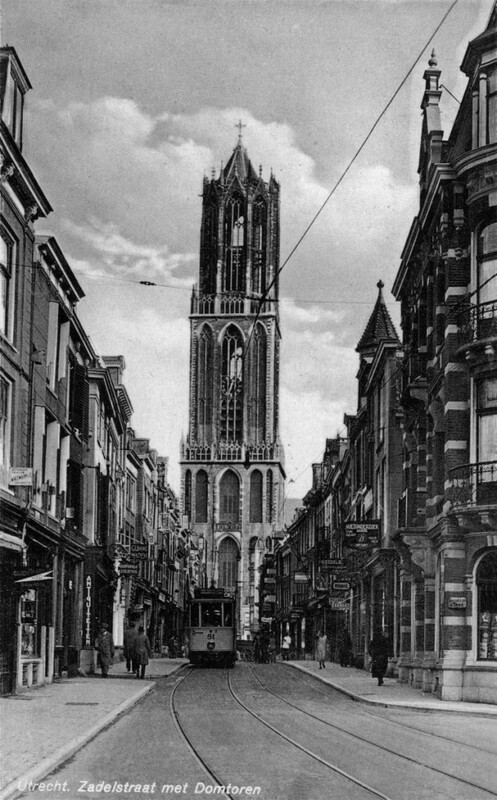 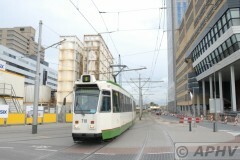 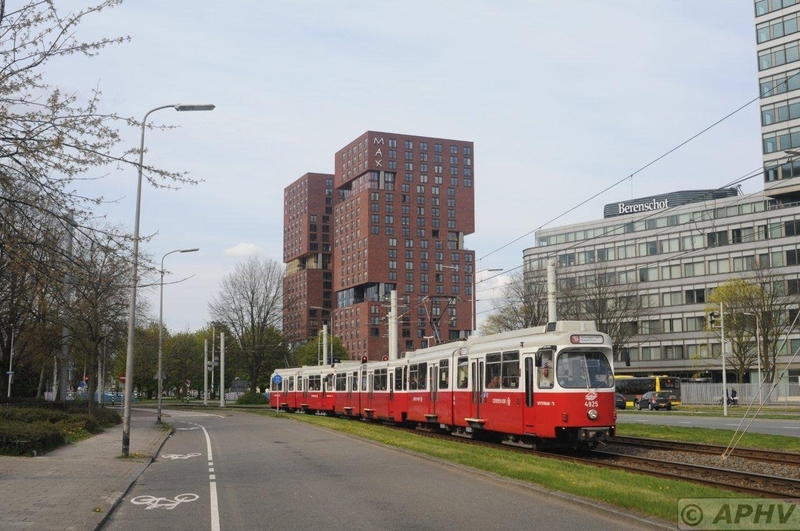 GTU 51 on line 2 b just under passed the 112,32 meter high Dom tower and is seen at Zadelstraat. 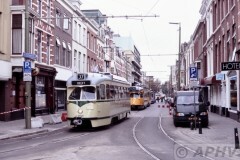 Today even a one way running bus 2 is banned from this street. 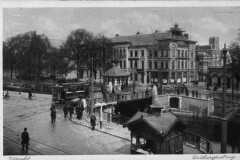 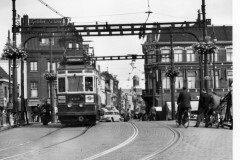 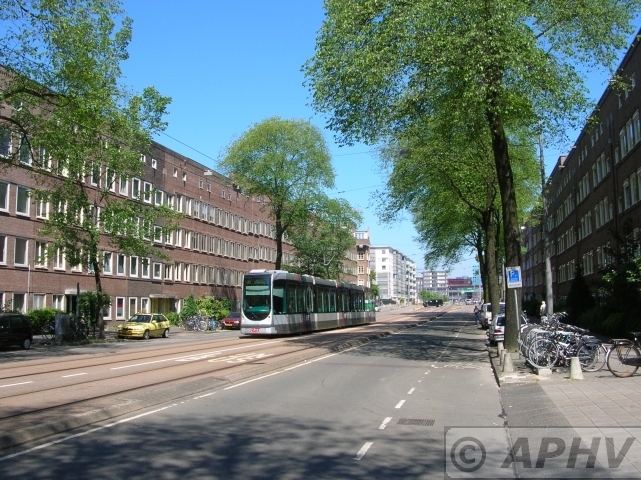 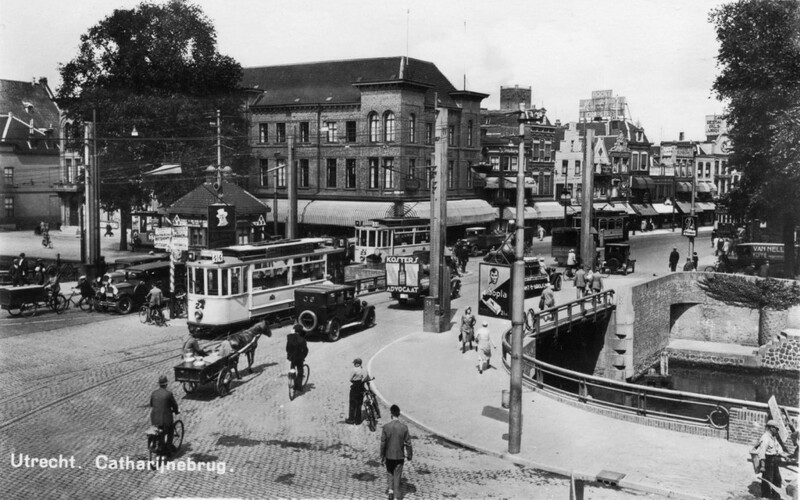 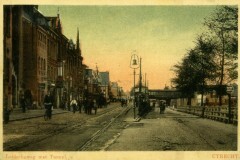 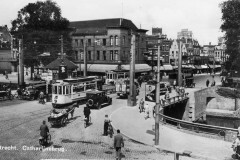 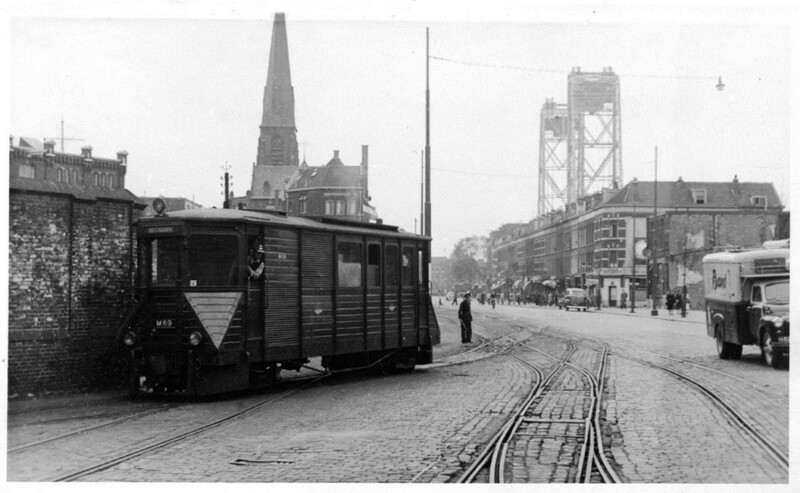 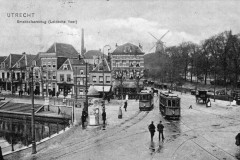 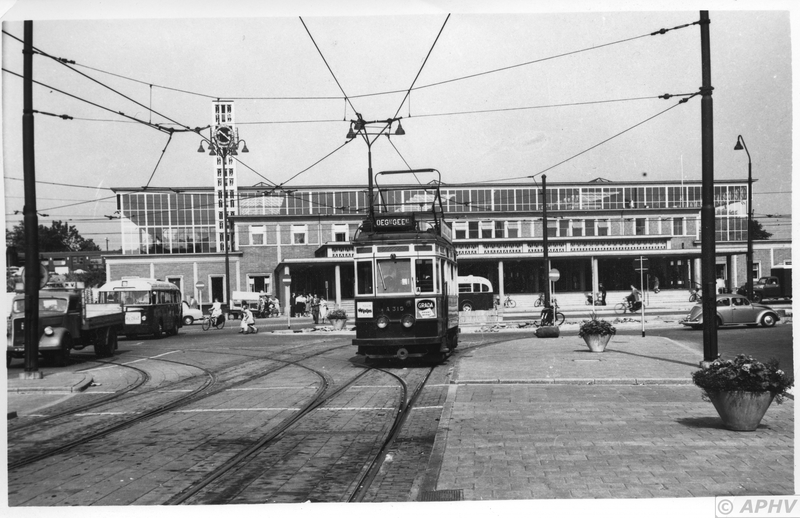 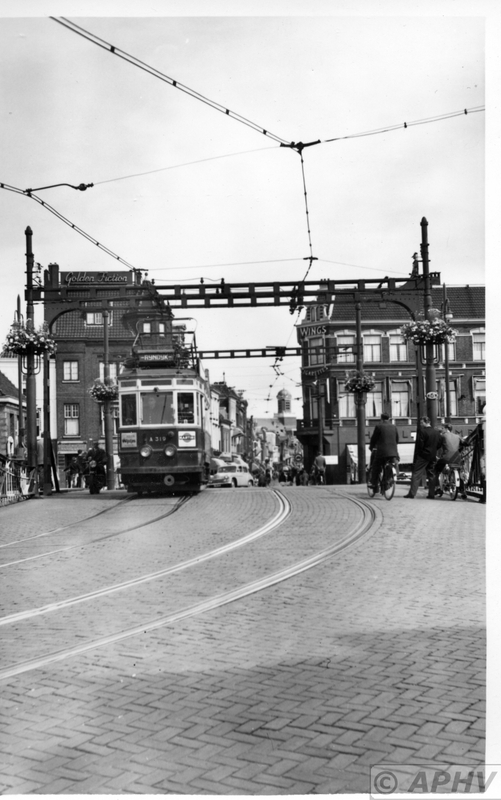 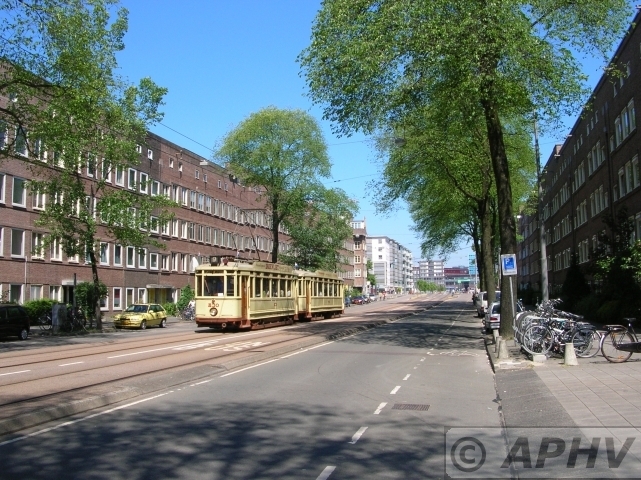 Utrecht Catharijnebrug 1928-32 GTU trams and a glimpse of a green NBM tram. 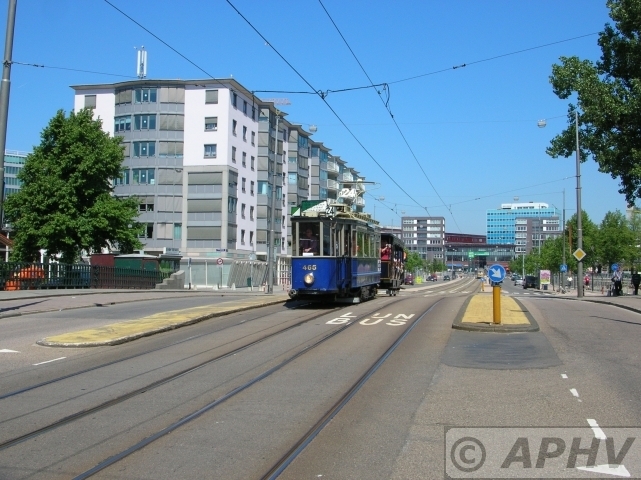 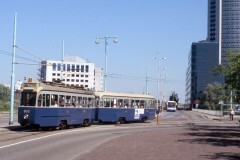 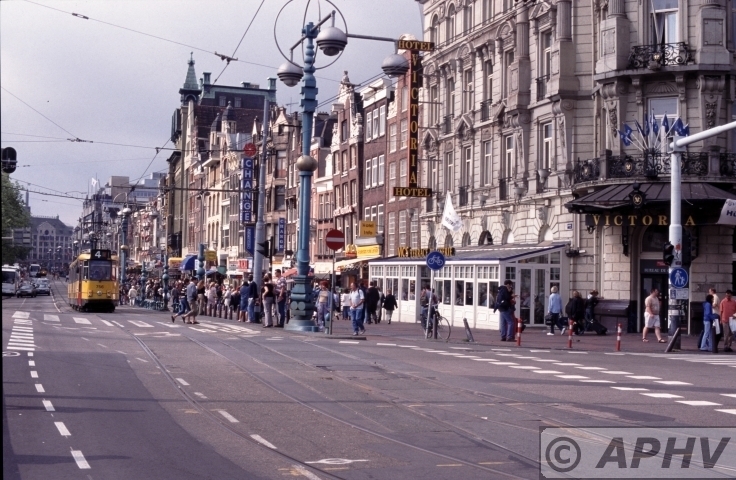 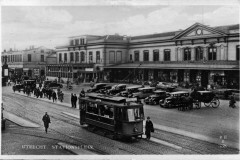 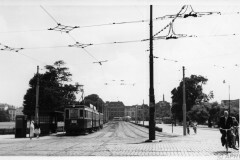 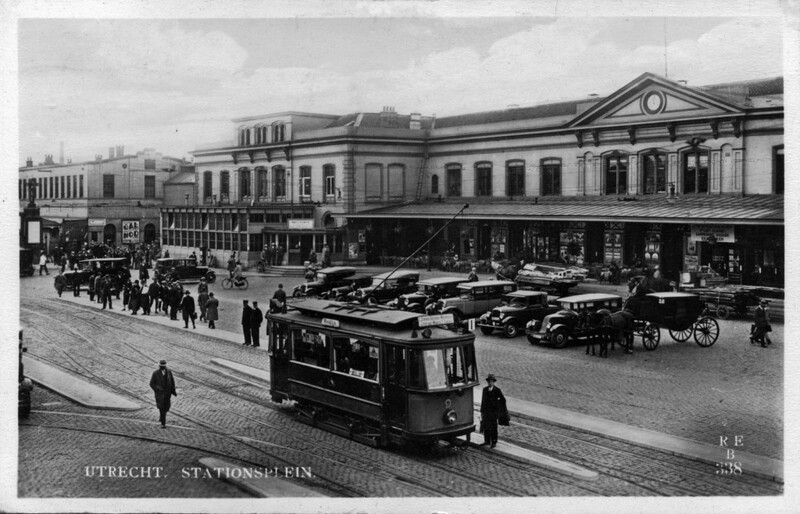 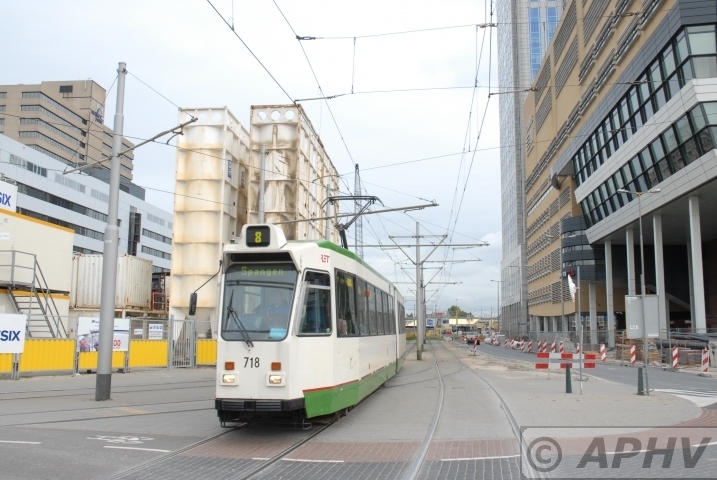 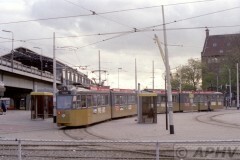 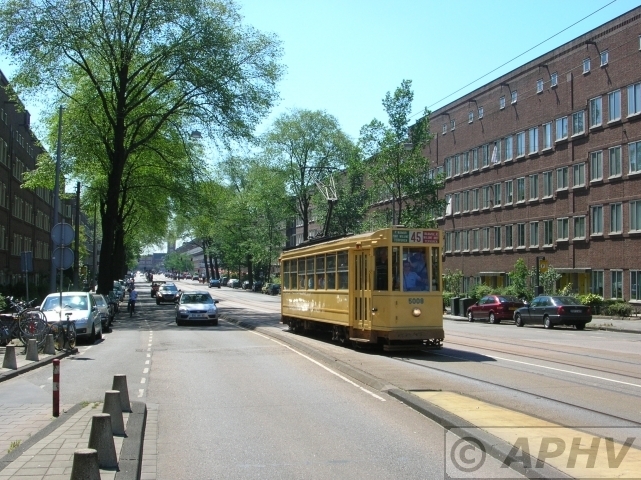 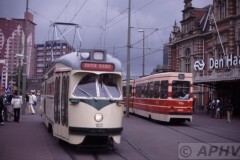 Five trams on one photograph. The first is GTU 24 on line 4m and GTU 23 on line 5. The third car is hidden behing a lamppost but might have the numer 35 but is a Werkspoor build car from series 33-38. 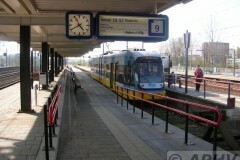 The last two are another GTU car appearing and a northbound NBM car. 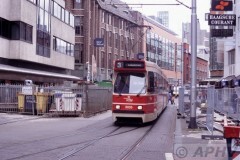 16 October 2004 HTM 2 its appearance surprised all. 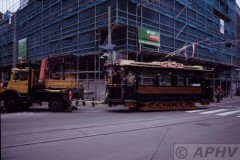 No2 here still without motors and towed by an Unimog tactor. 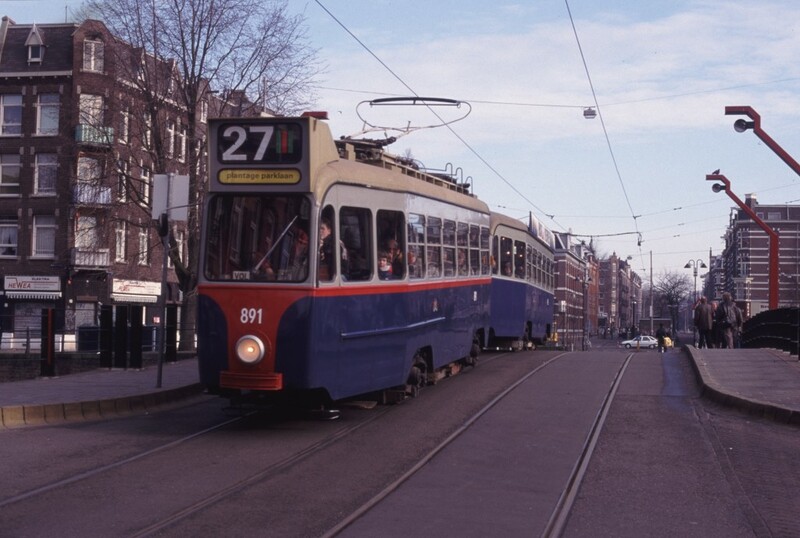 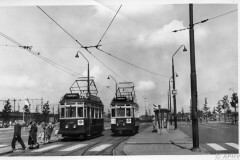 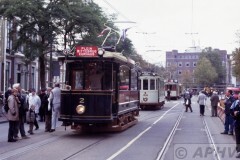 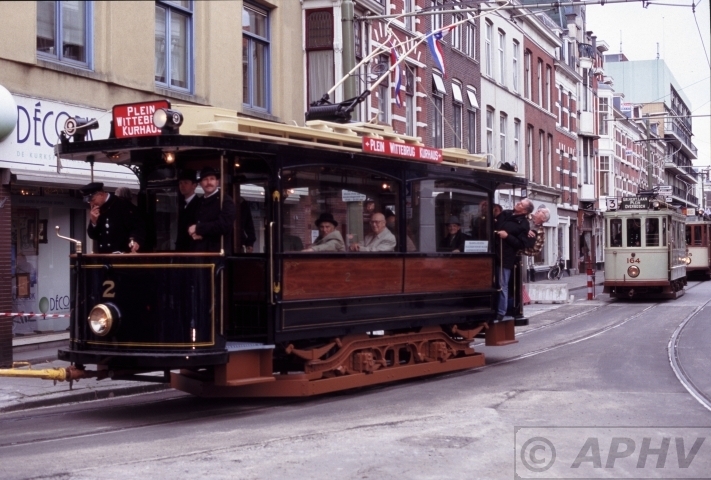 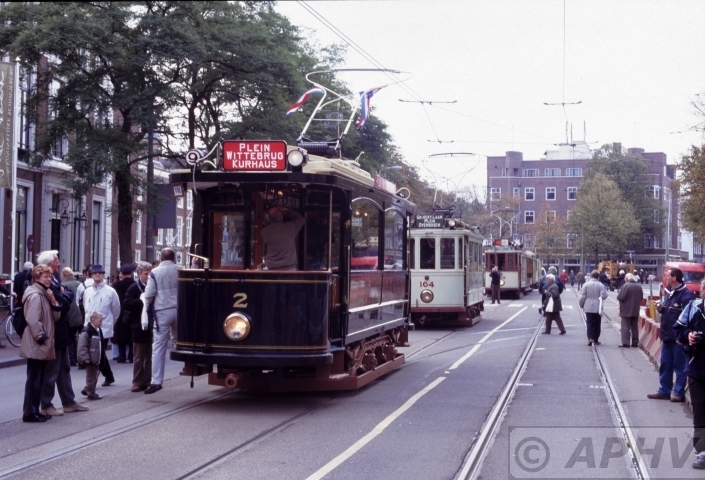 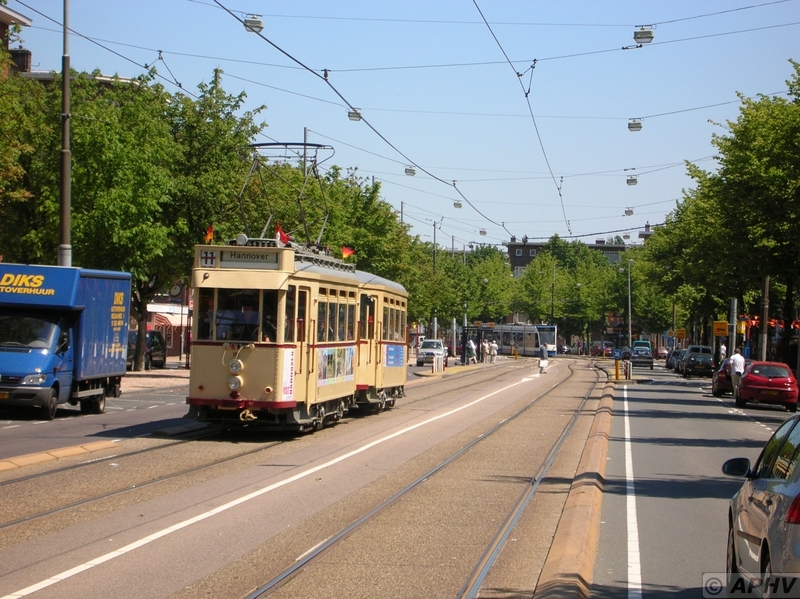 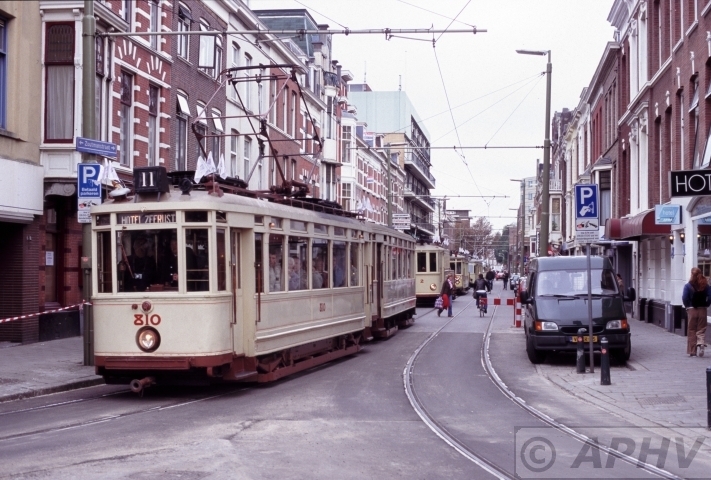 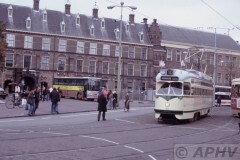 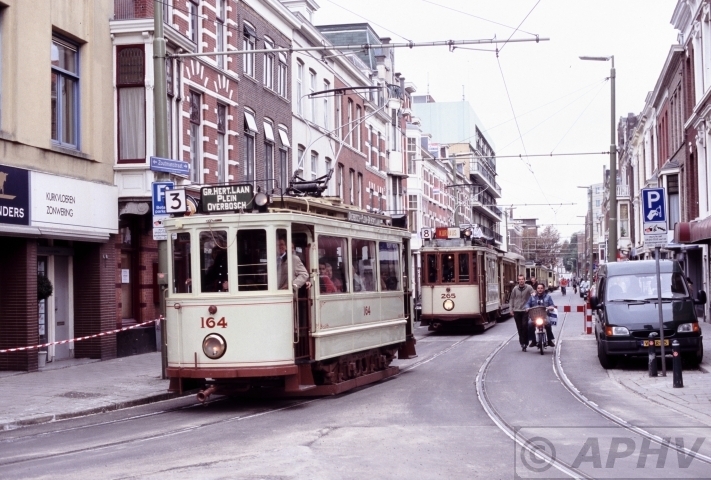 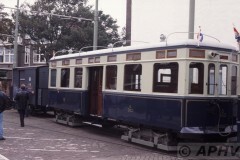 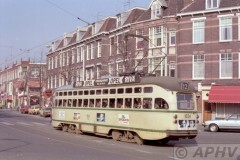 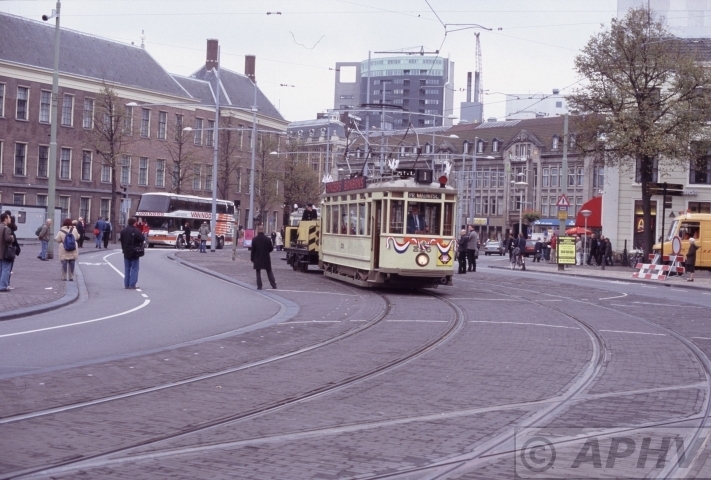 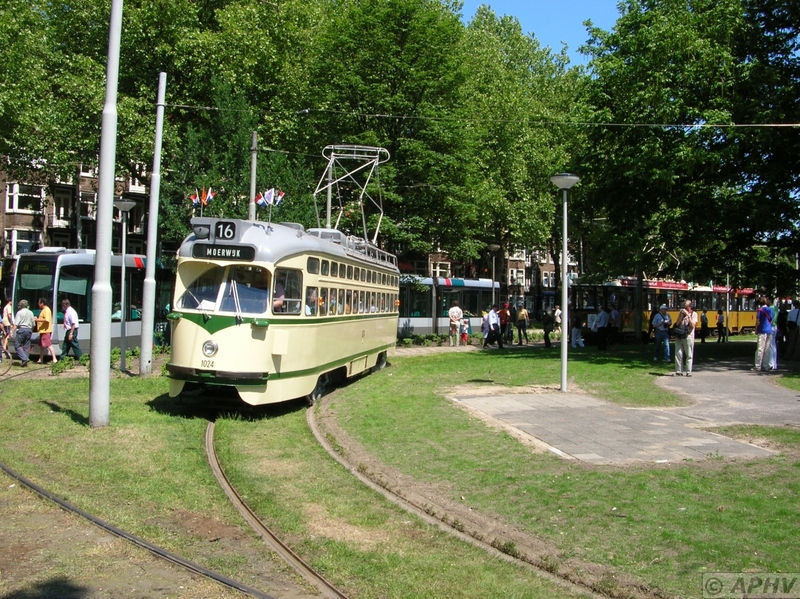 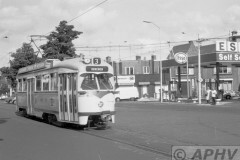 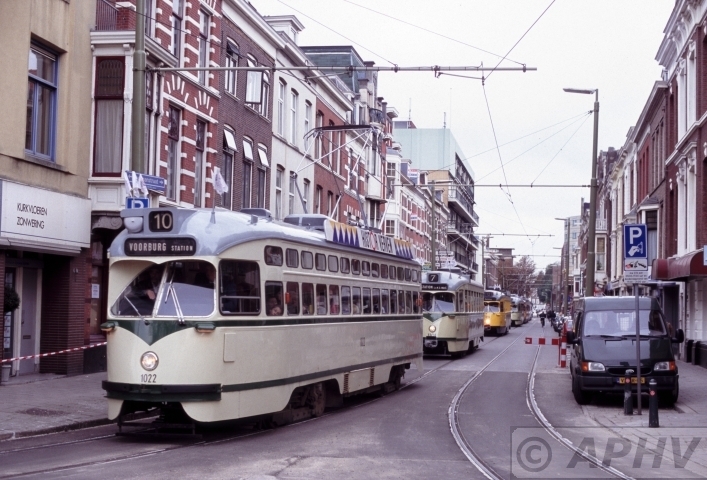 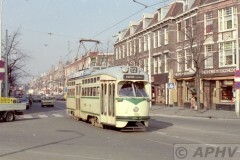 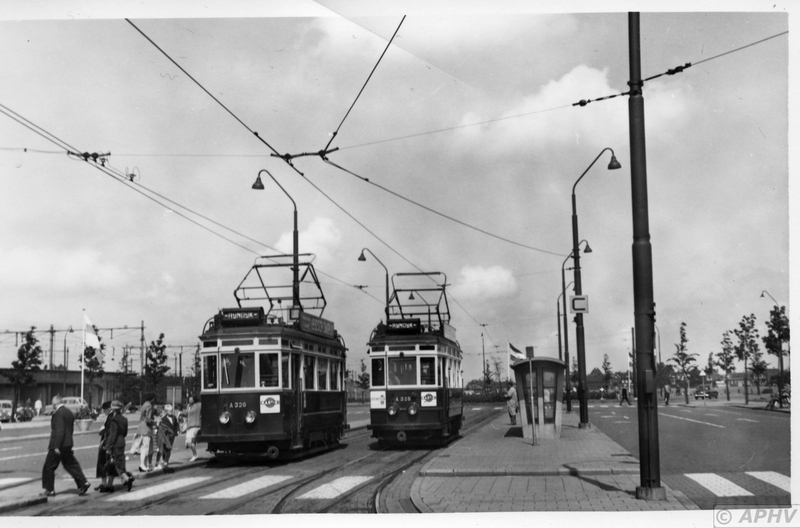 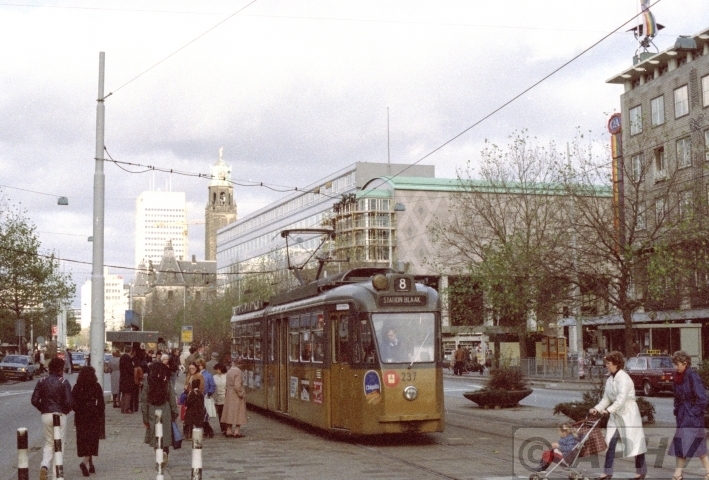 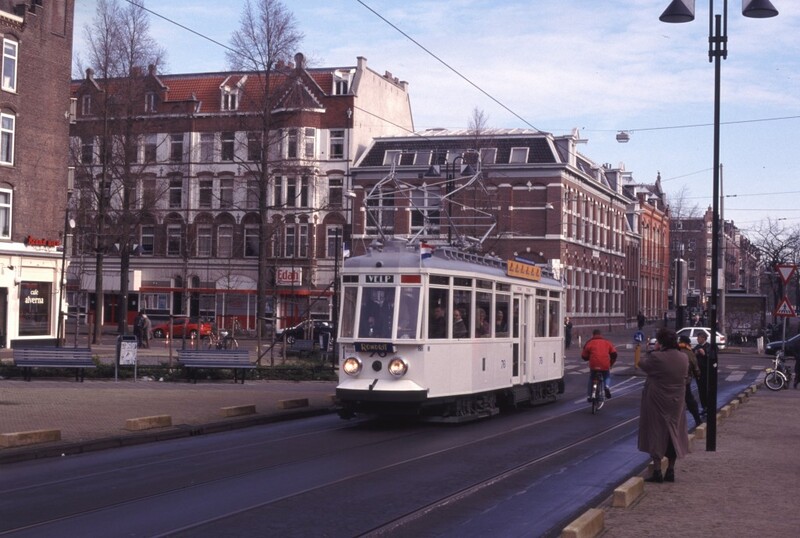 The first 20 Den Haag motorcars were the same design as the large Union series in Amsterdam. 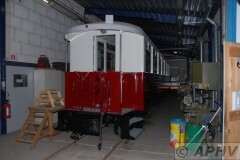 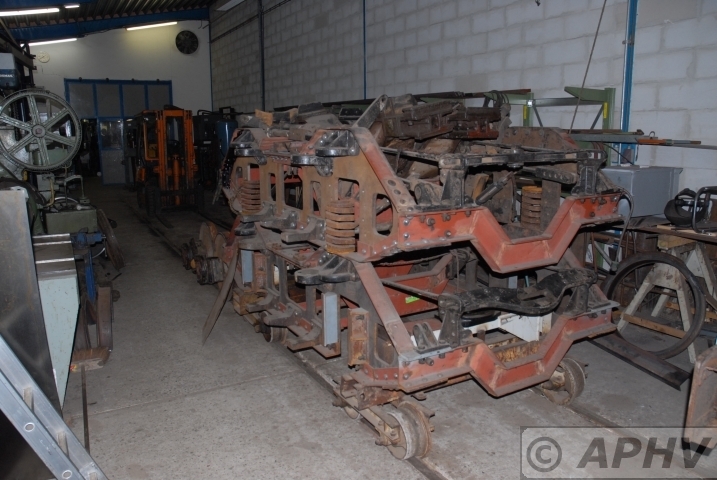 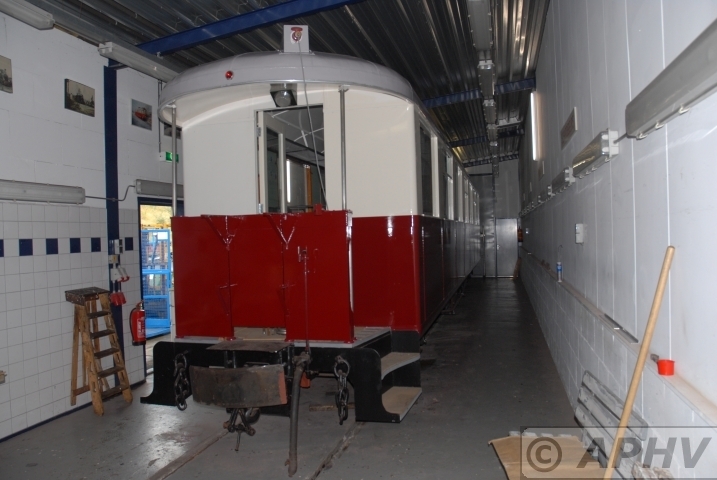 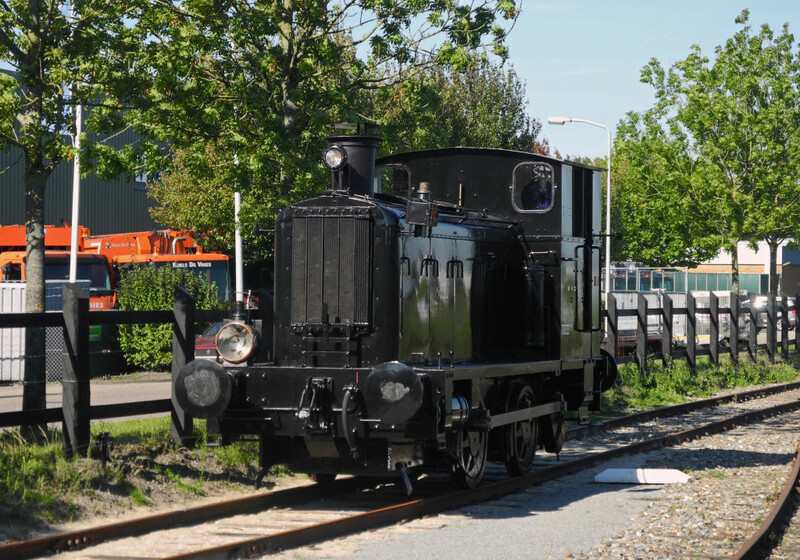 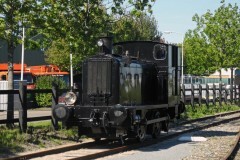 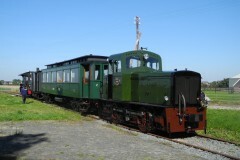 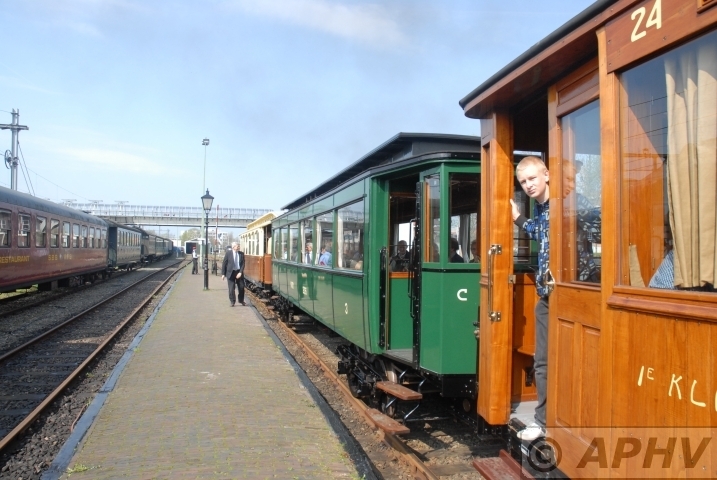 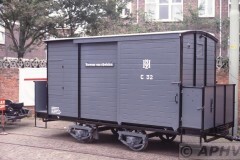 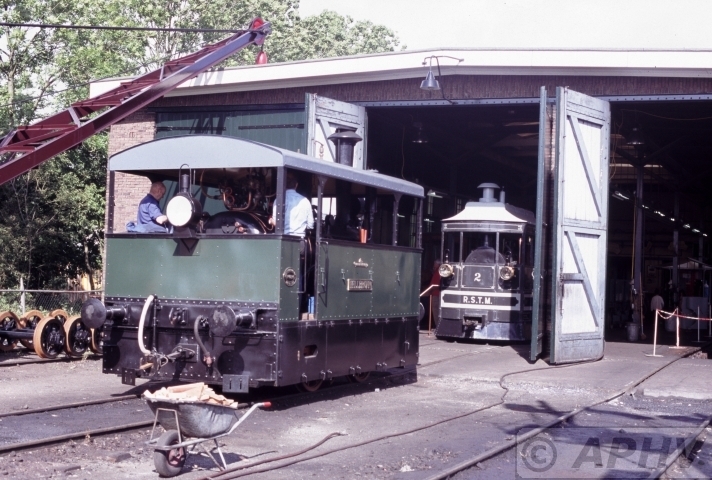 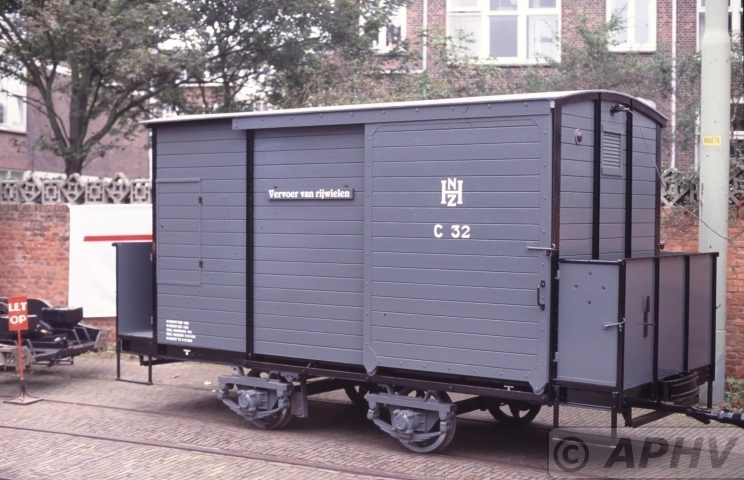 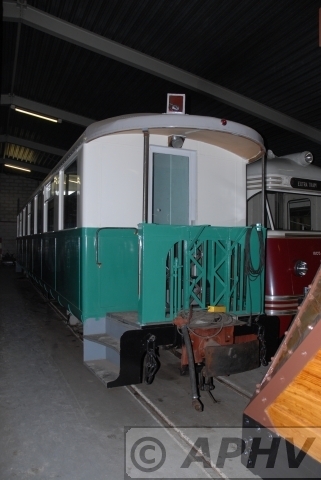 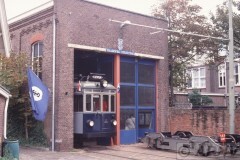 16 October 2004 HTM 2 (former Amsterdam Union body with a new build truck made in Ouddorp-RTM museum) at Tournooiveld. 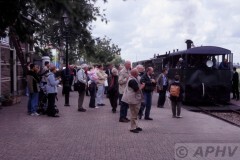 The show has started and the wheather was good. 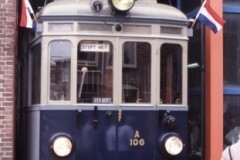 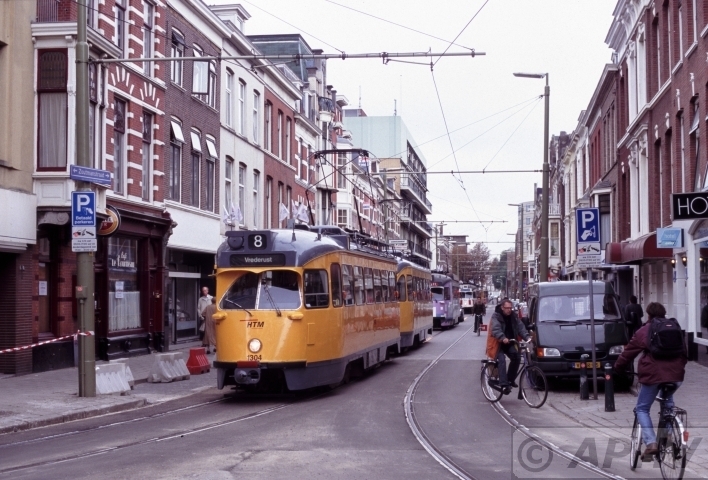 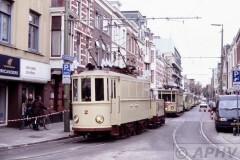 16 October 2004 HTM 2 on tour Zoutmanstraat followed by 164 Mr. Jan Voerman is the second passenger and the first one is Mr Hans de Herder. 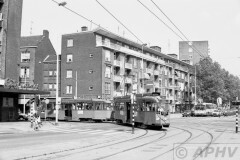 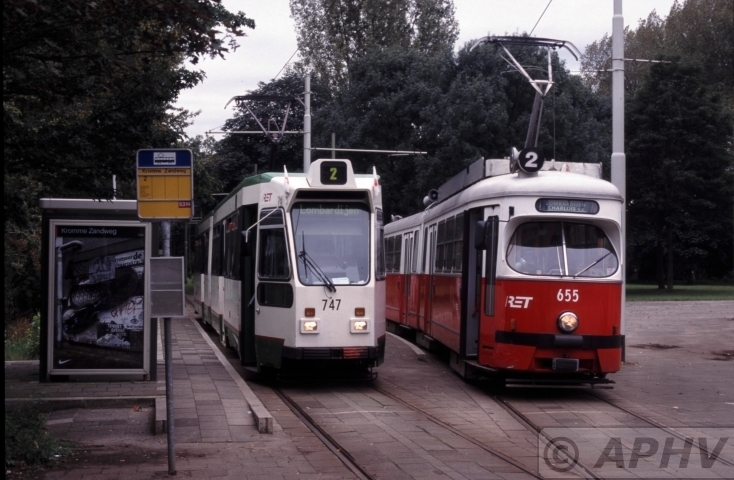 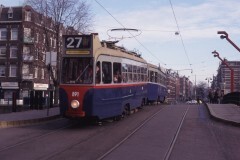 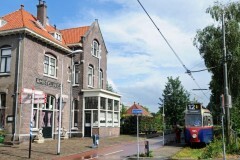 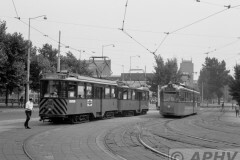 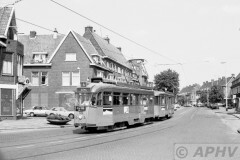 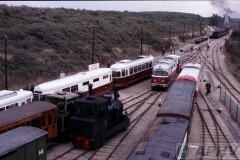 HTM215 and 780 followed by PCC1922 at Buitenhof. Houten 10 January 2001 The starting point. 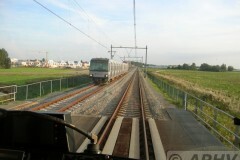 HTM6021 on the tracks off what is supposed to be a 4 track main ine through Houten. 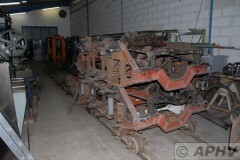 Tecnically these spurs are suited for 200 km/h operation. Houten 10 January 2001 HTM6021 nearing the southern terminus off the shortest tramway in The Netherlands at Houten castellum. 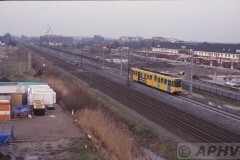 Houten 10 January 2001 Houten Castellum terminus with HTM6021. Behind this stop is a large housing area being build. 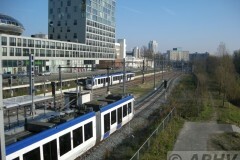 One wonders why the line was not lenjthened into this new housing area. 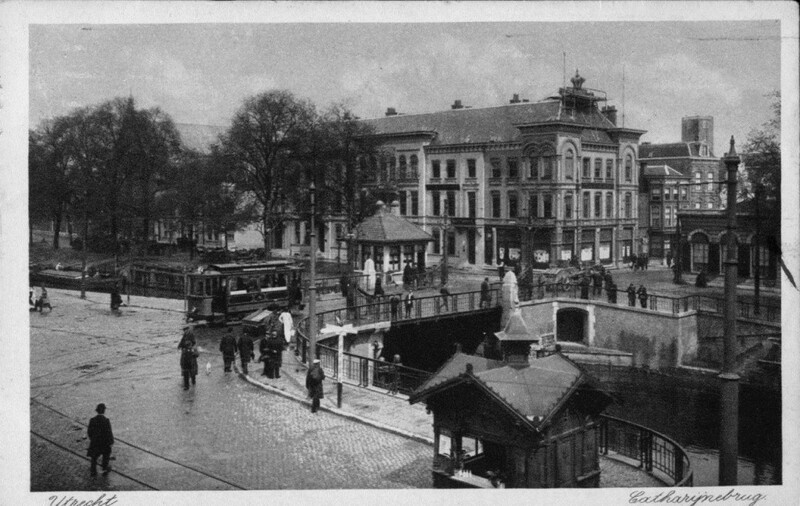 A bid useless experiment one wonders. 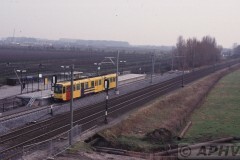 Houten 10 January 2001 HTM6021 ex Ustra Hannover at the southern terminus Houten Castellum. 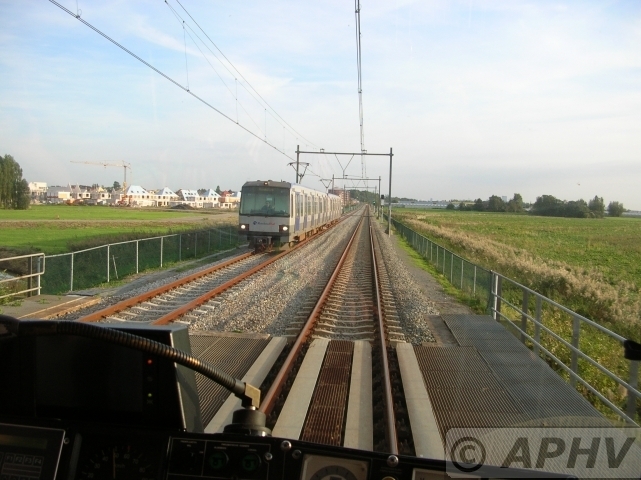 Randstadrail HTM operation on the former Zoetermeer NS railway line 18-11-2007 connection between HTM and NS tracks is a 1400 meter long viaduct 4042 running through it. 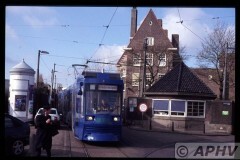 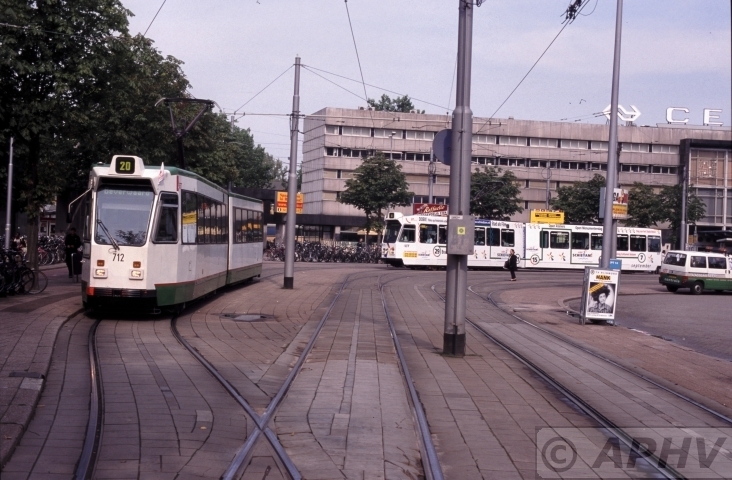 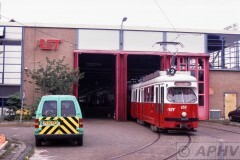 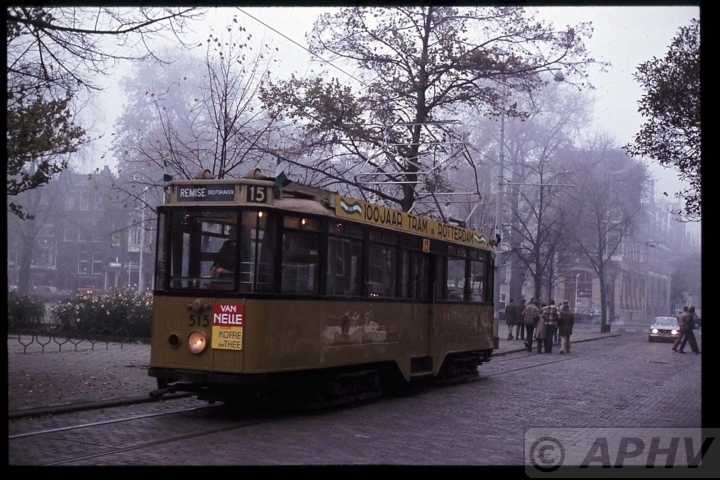 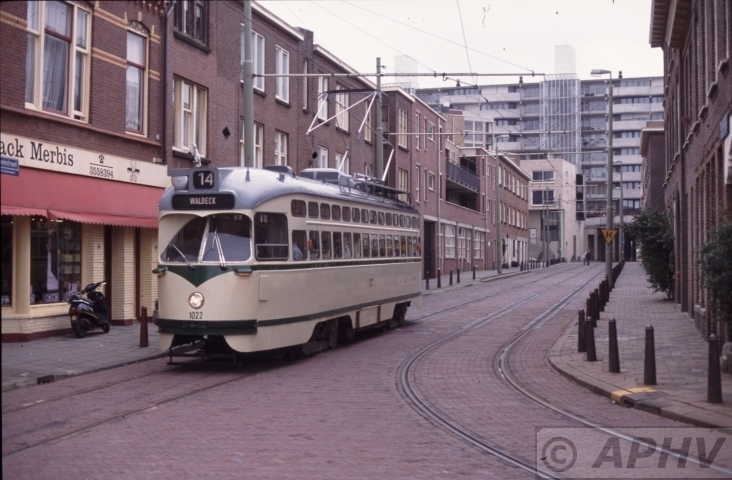 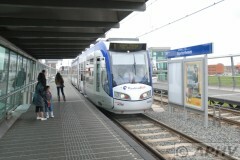 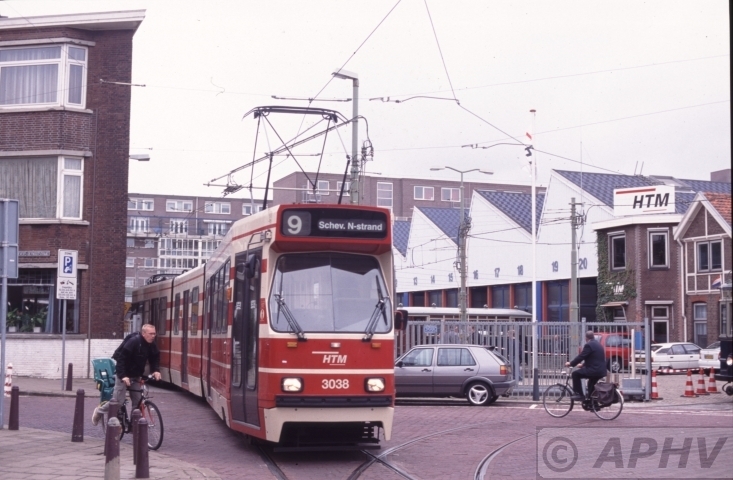 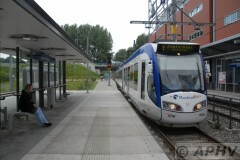 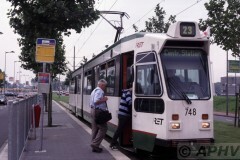 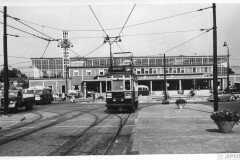 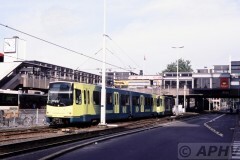 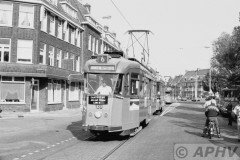 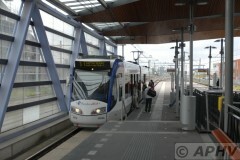 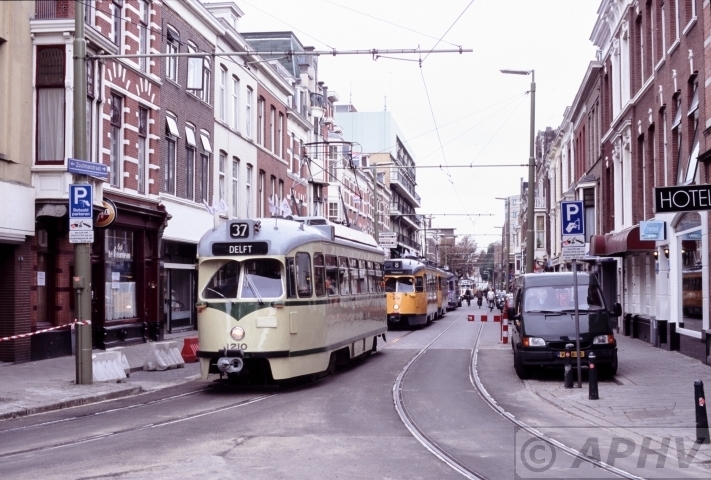 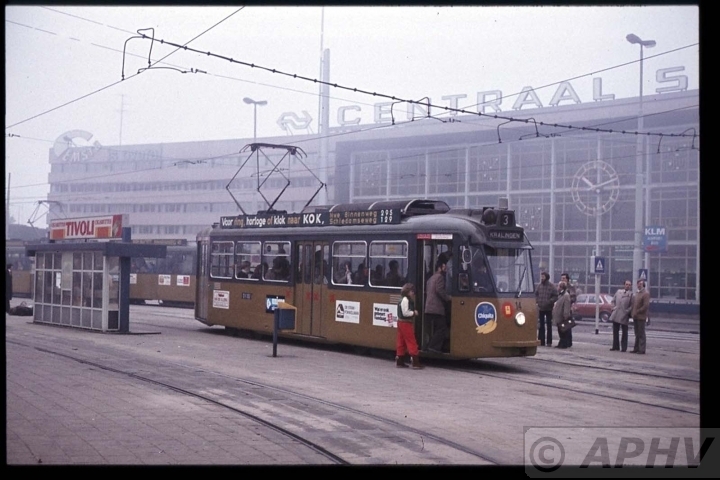 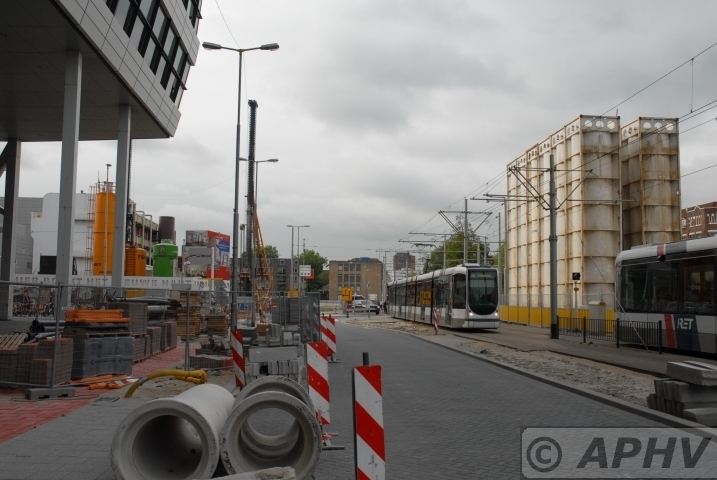 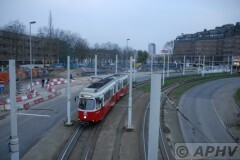 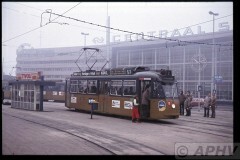 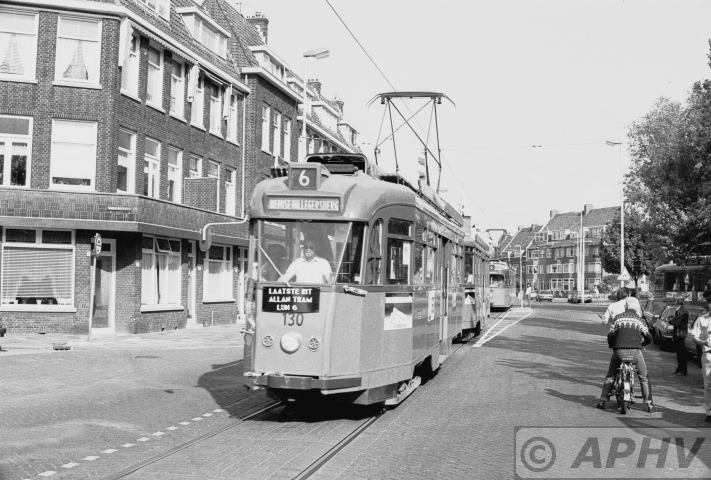 (15368) Rotterdam RET 239 lijn 8 terminus at Blaak NS station when it was still above ground level. 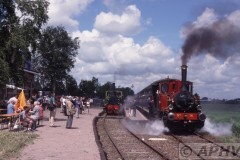 (14854) RET 130 and 1029 line 6 last active Allan build set performing its very last run. 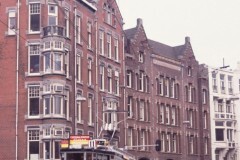 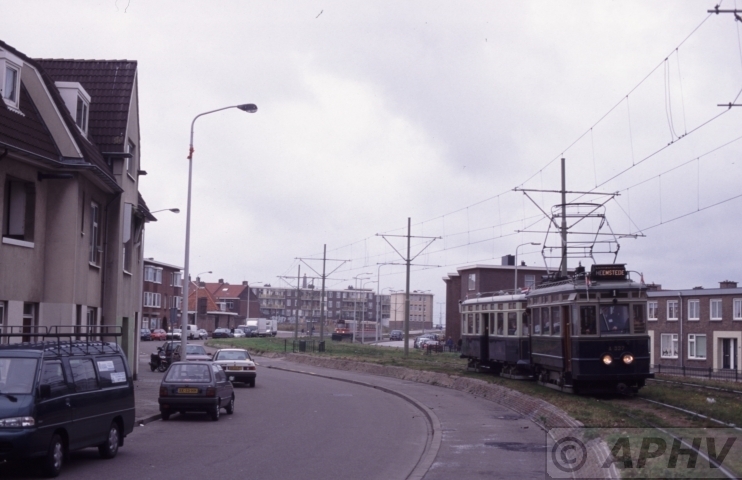 28 May 1982 at Spangen Huygensstraat with Sparta castle in the back ground. RET659 ex Wien on 9 September 2002 at front off the Hilledijk depot. 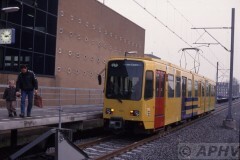 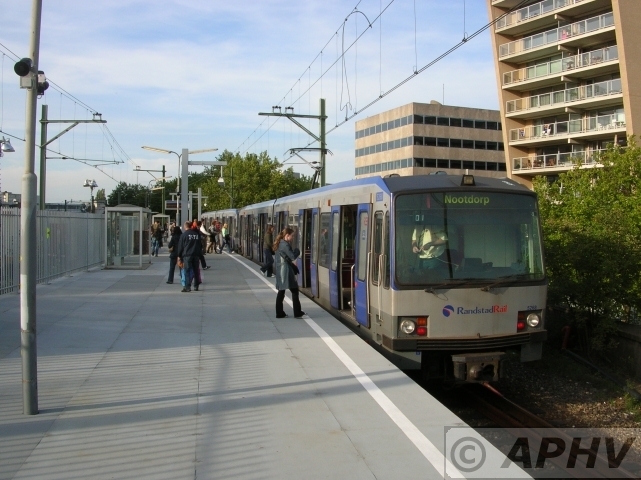 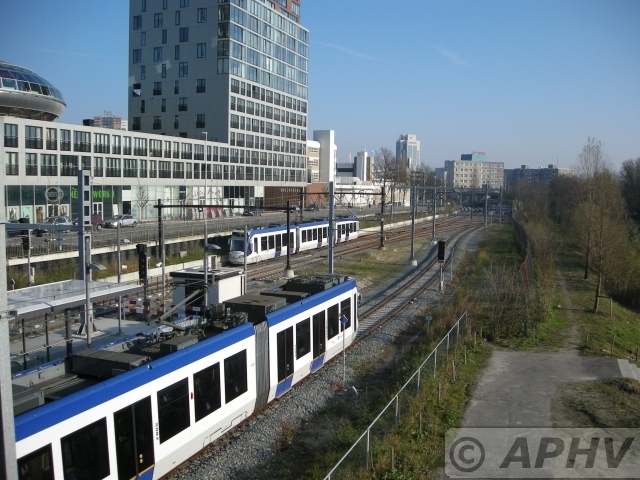 Rotterdam temporary Terminus line 23 was behind the Feijenoord footbal stadium at Stadionweg 9 September 2002 with captain Jackson boarding. 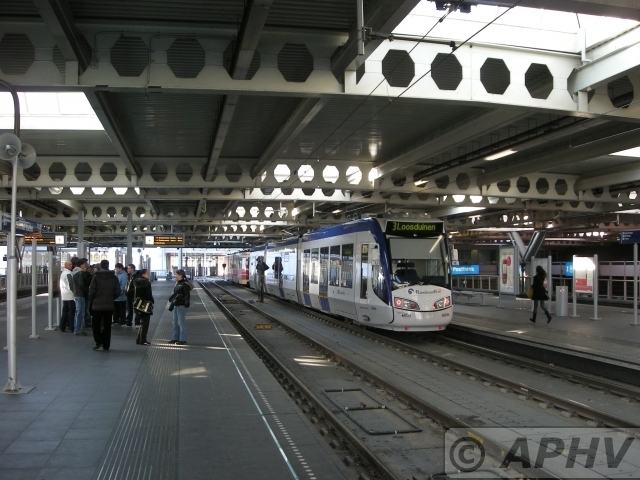 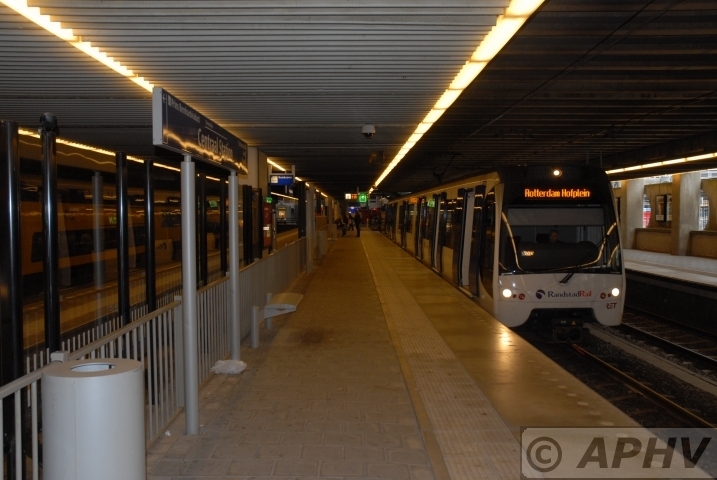 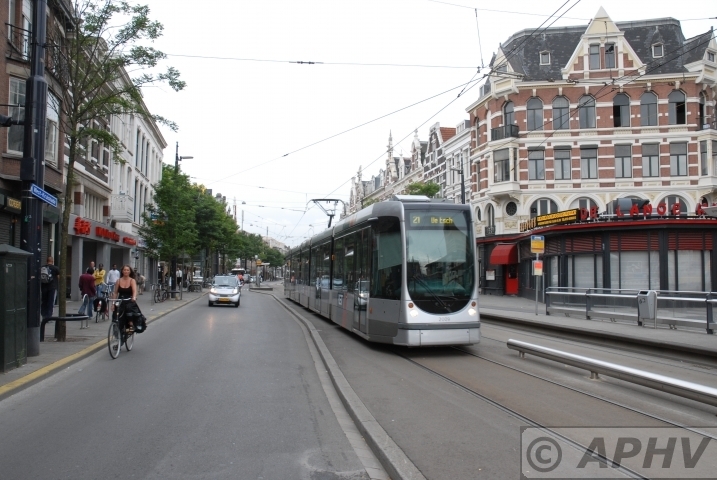 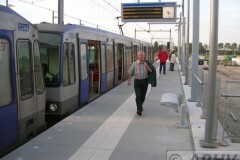 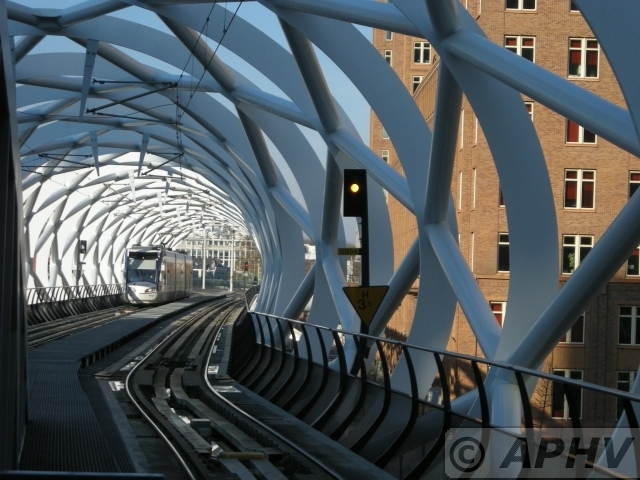 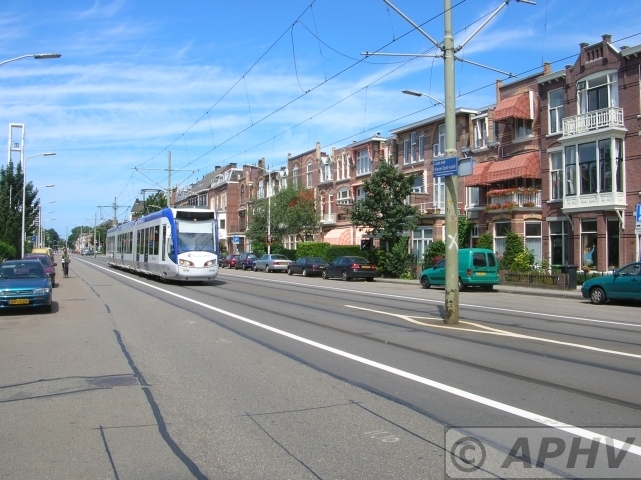 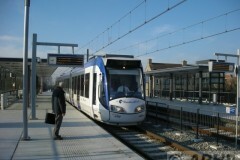 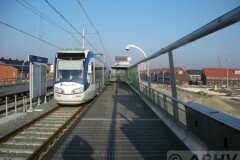 Now the line is lenghtened into IJsselmonde. 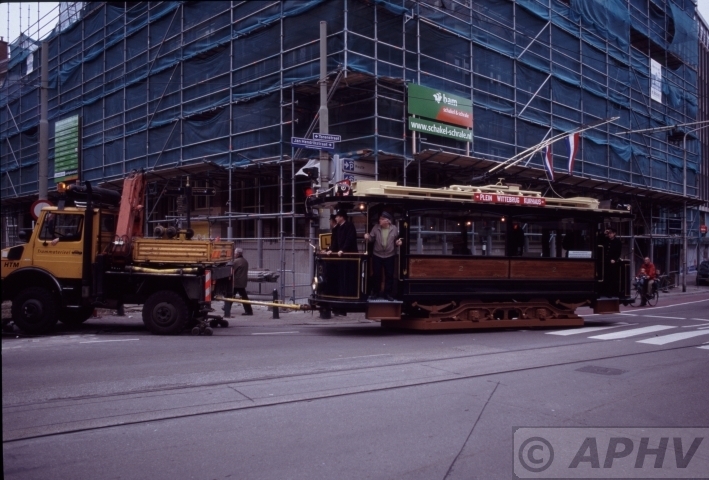 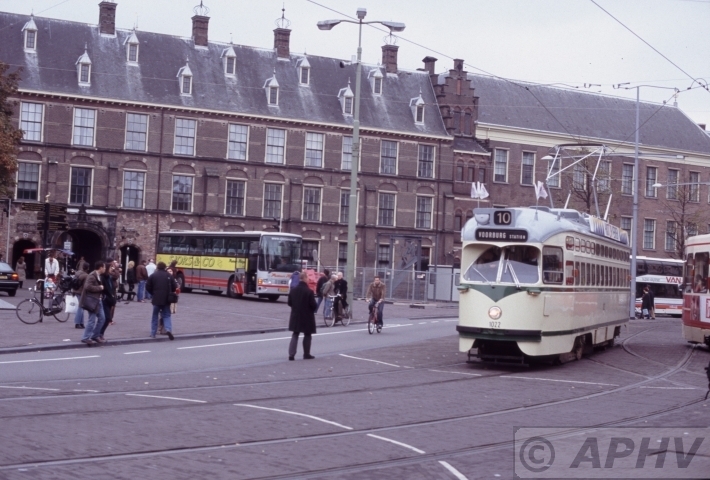 A (tram) dream come thrue, replica Beynes of Haarlem 1929 build GETA 76 (Arnhem) at Kwakersplein, Amsterdam 8 Februar 1998. 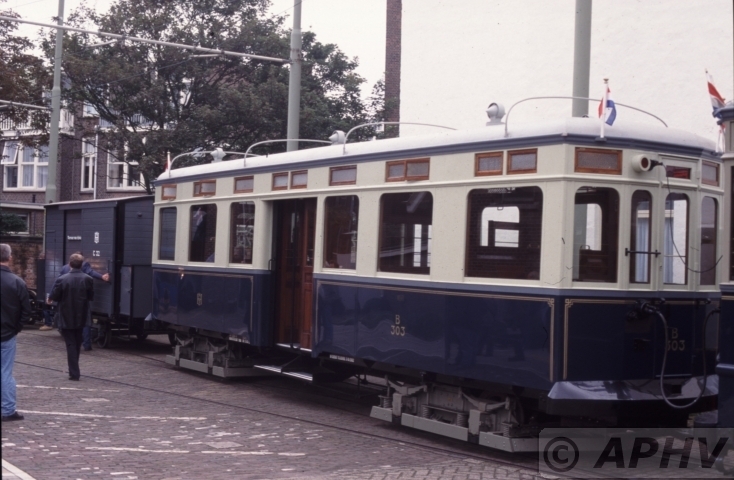 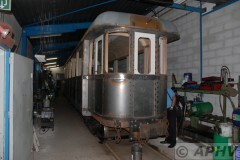 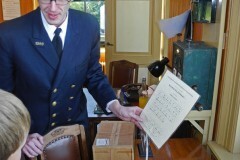 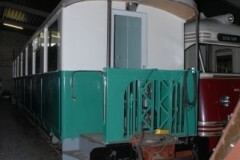 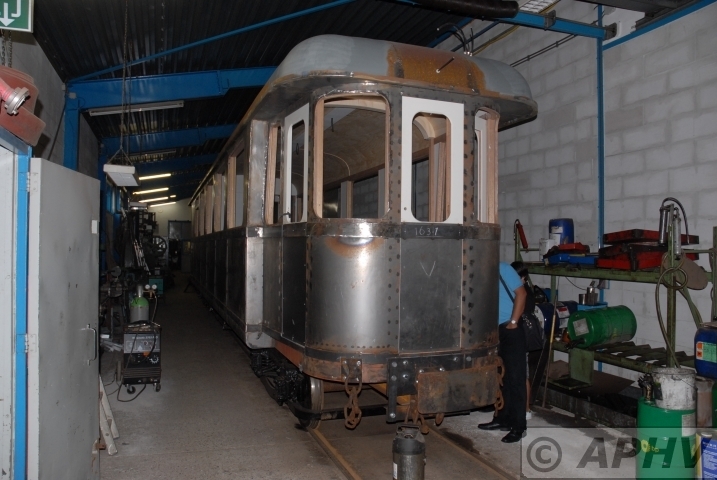 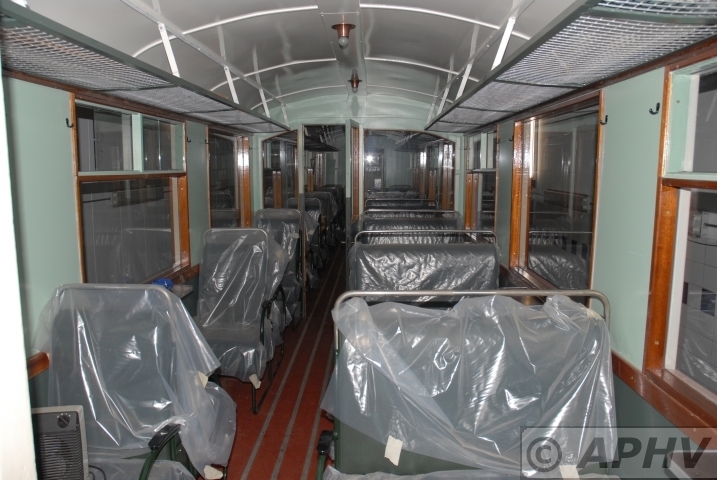 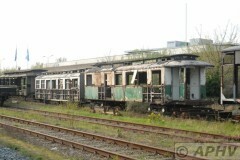 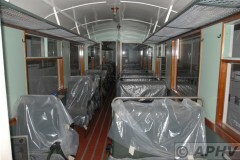 All original GETA Arnhem cars were eigther destroied in battle in 1944 or sold for scrap by the city councel in 1945. 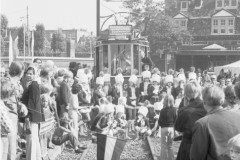 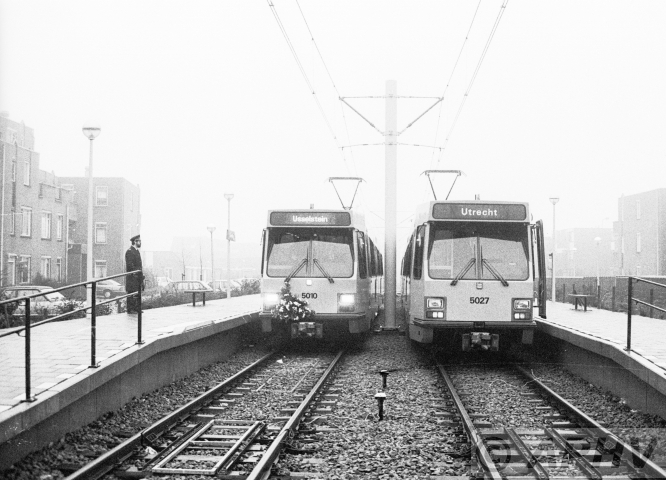 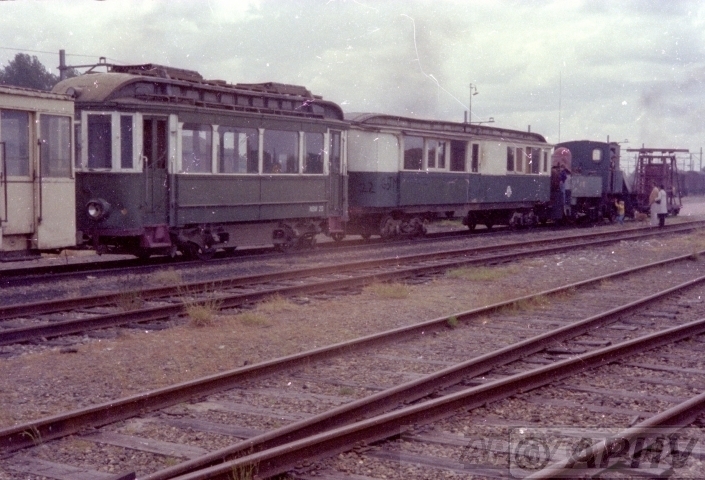 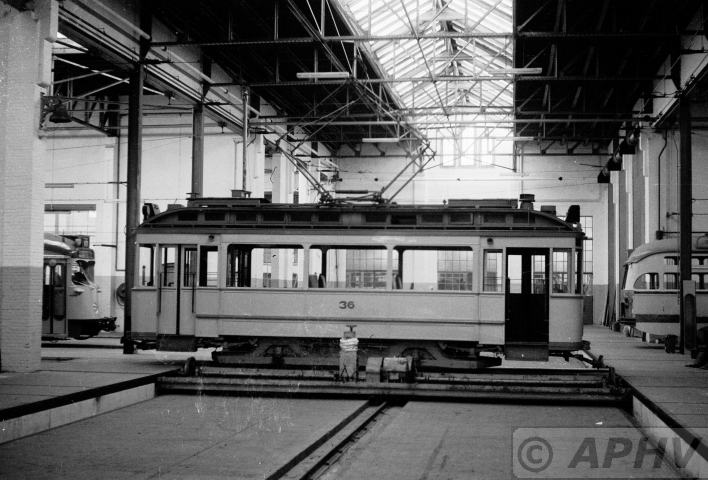 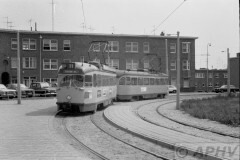 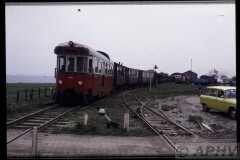 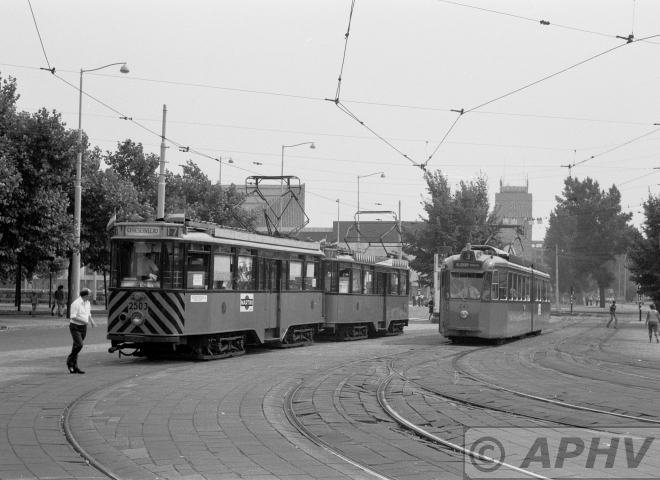 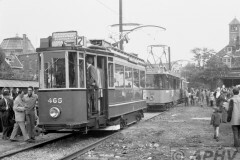 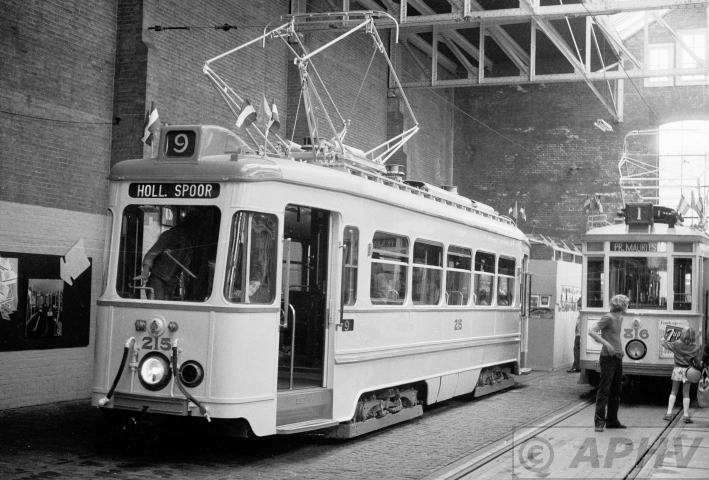 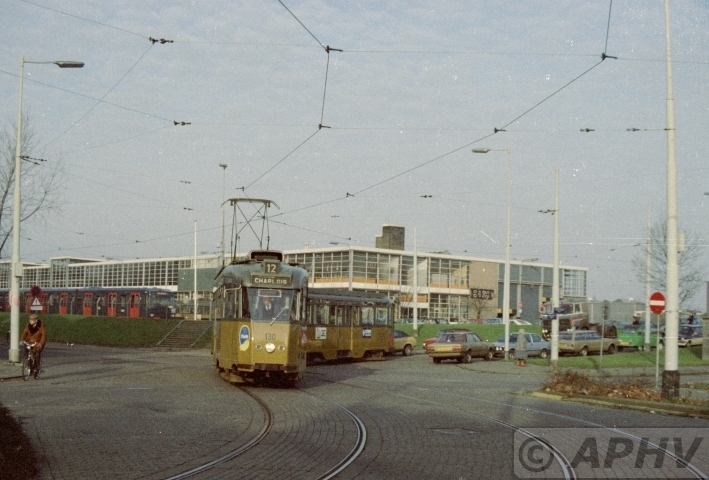 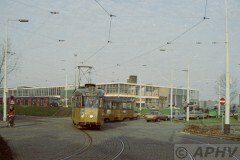 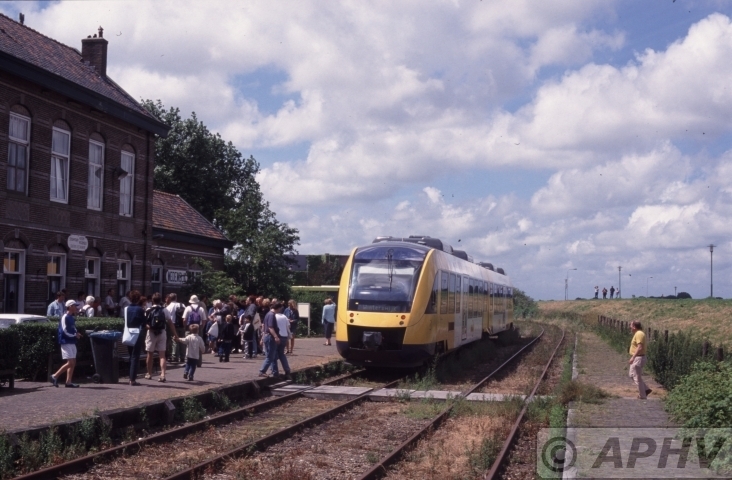 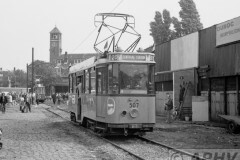 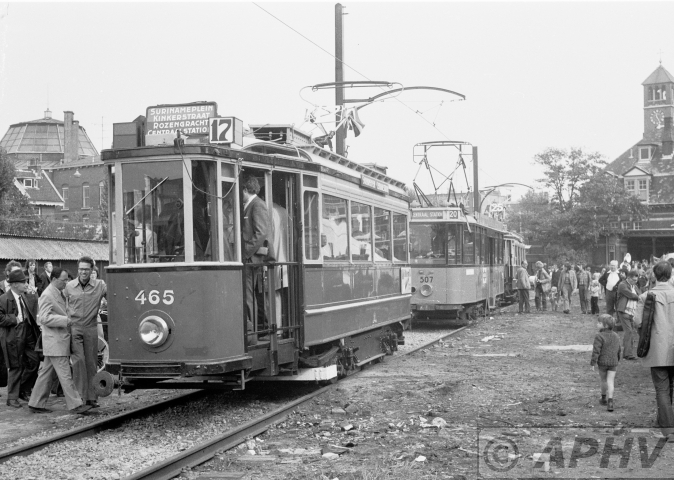 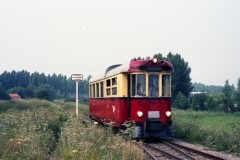 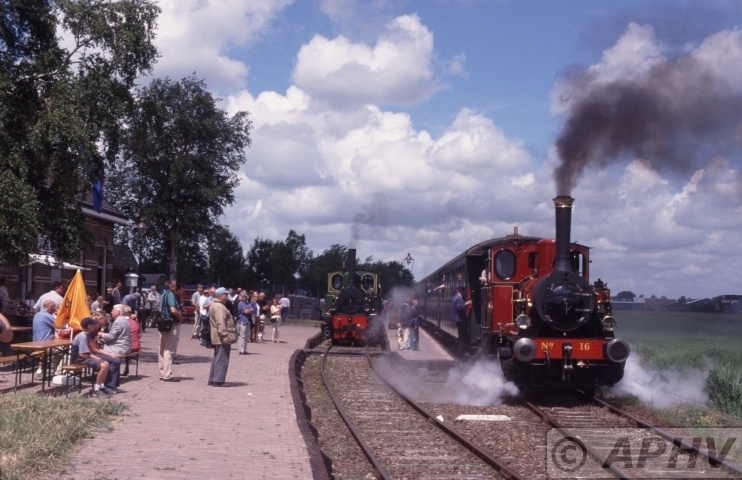 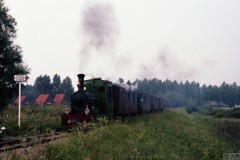 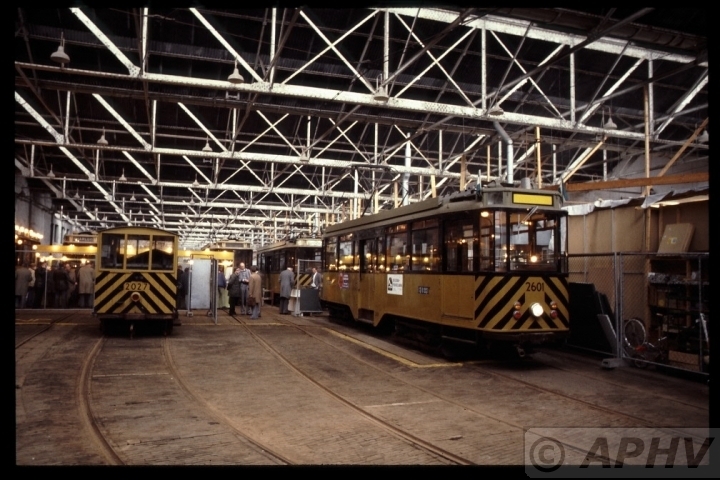 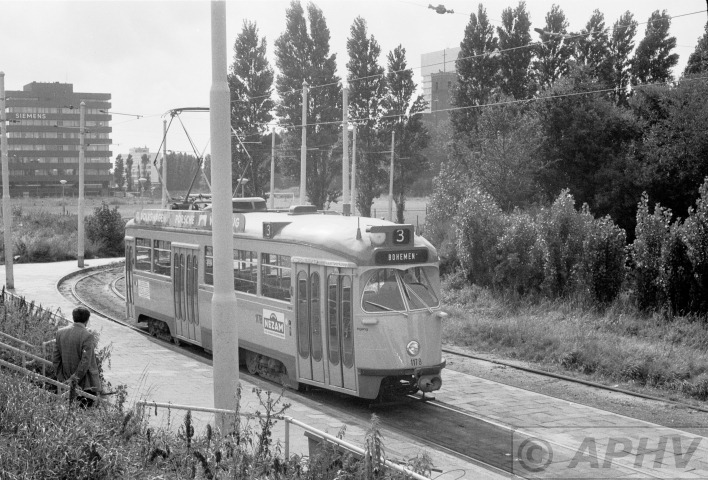 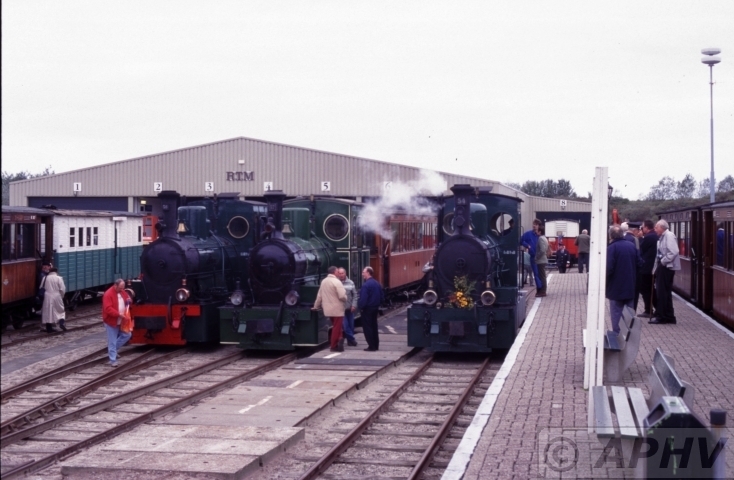 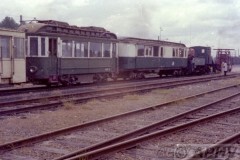 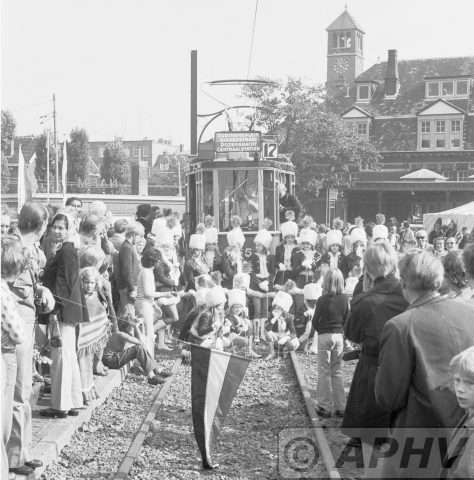 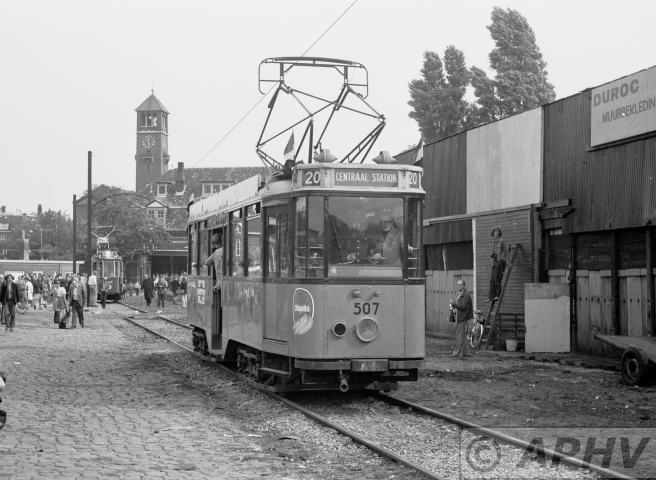 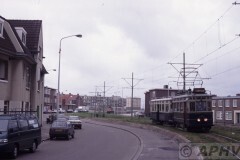 Opening Electric Museum line on 20-9-1975 behind the former Haarlemmermeer station. 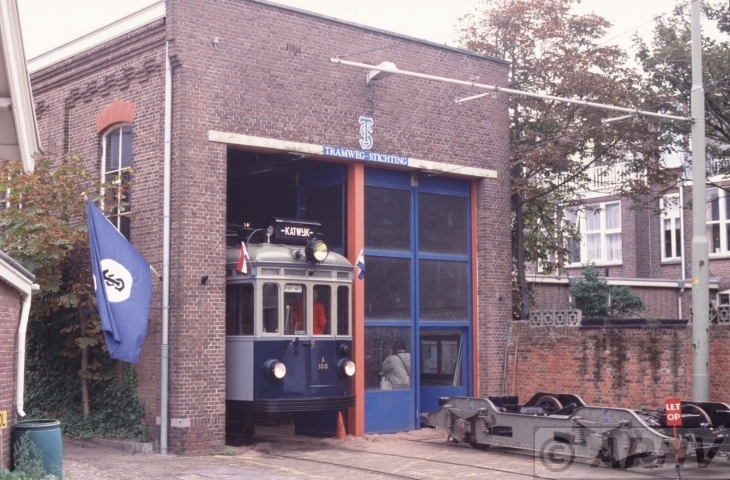 16 August 1975 Den Haag museumcar HTM215 belonging to the first series off new cars after WWII. 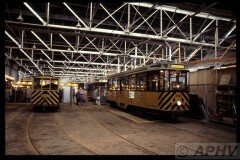 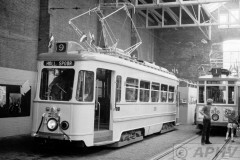 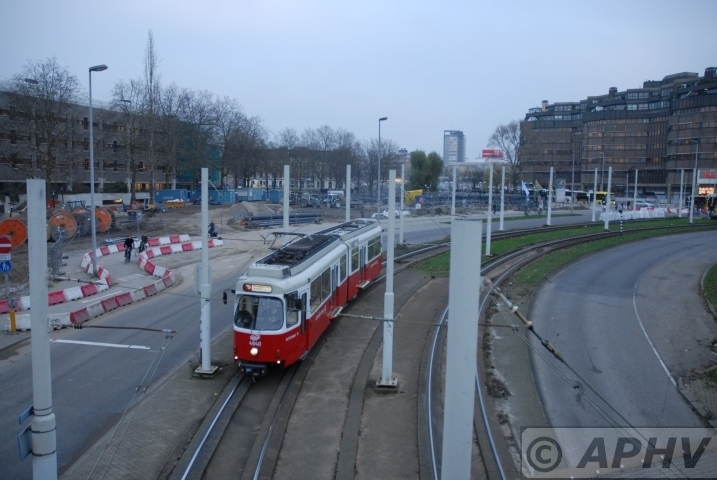 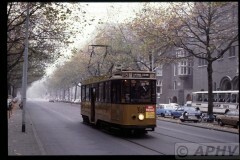 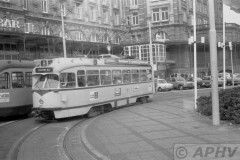 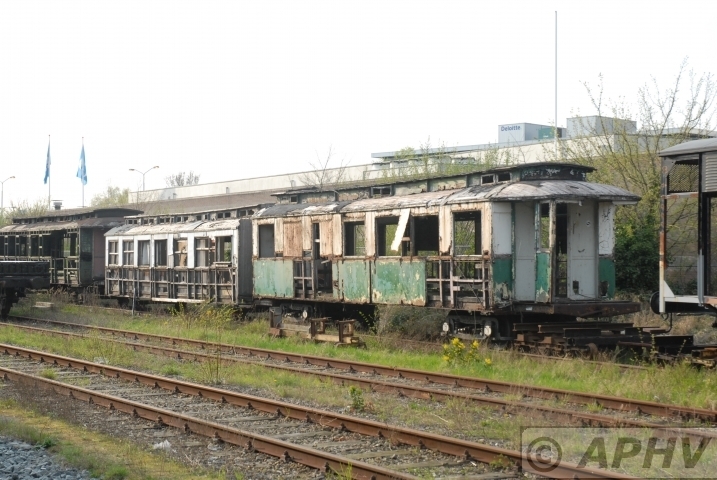 Being not very succesfull the cars did not last very long and were soon replaced by PCC cars. 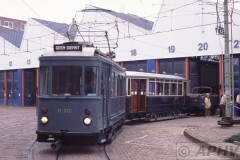 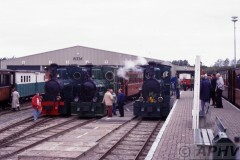 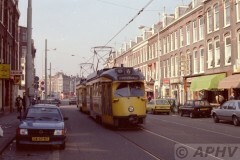 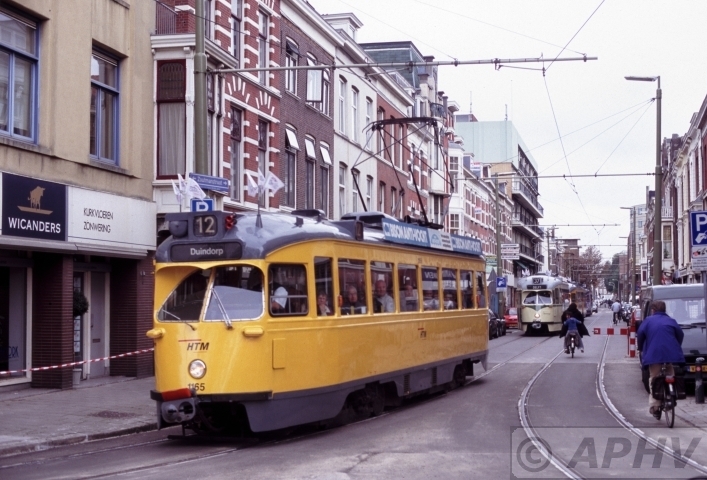 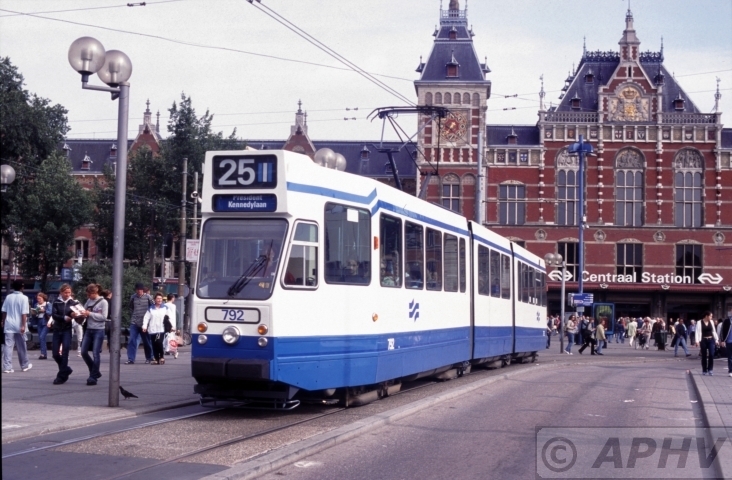 HTM 1304 1337 2106 leaving Franshalsstraat museum depot on 28 August 1999. 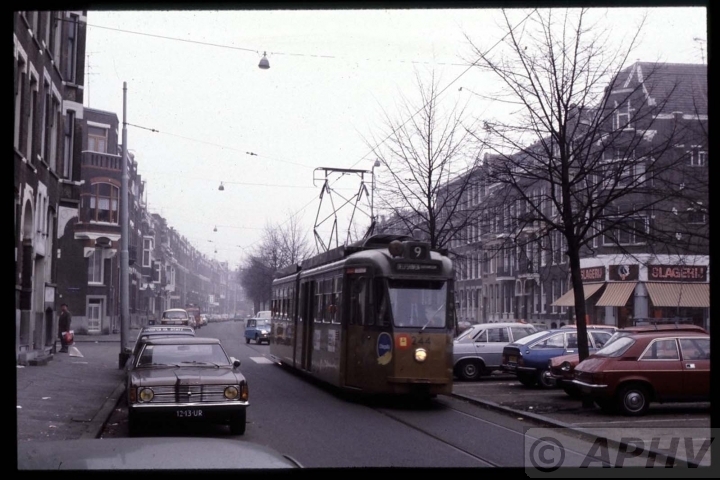 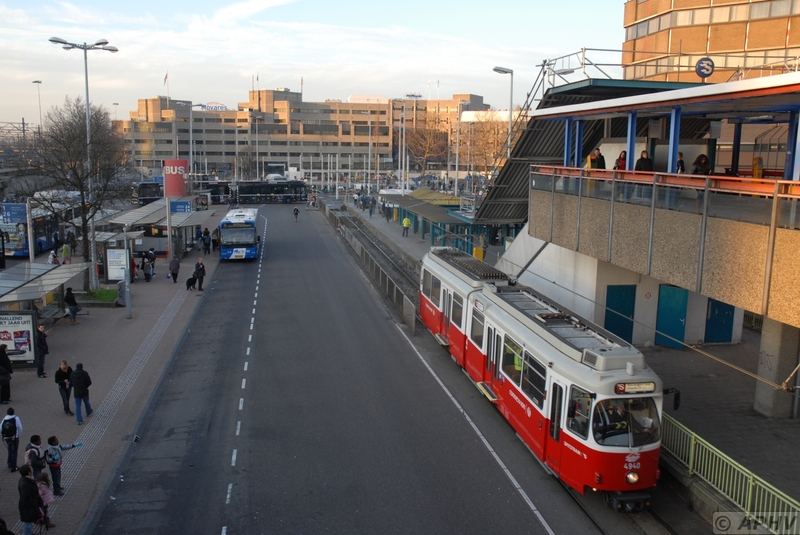 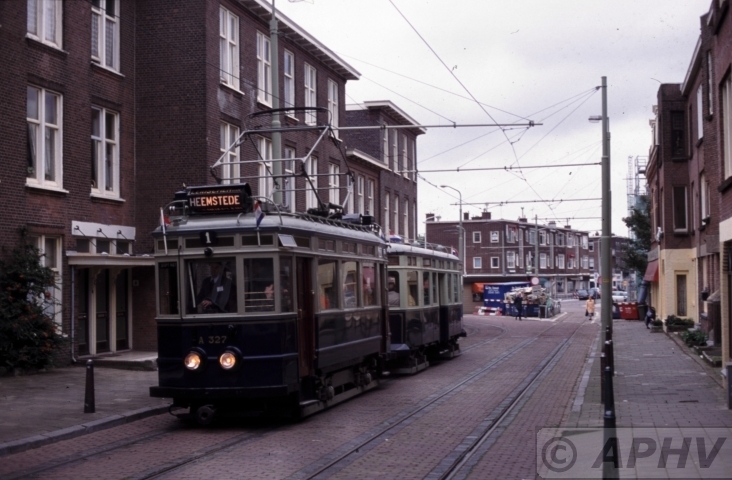 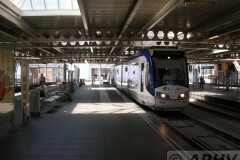 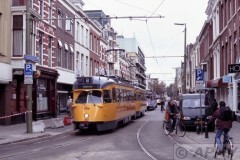 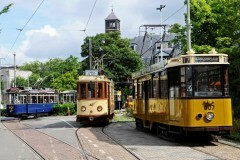 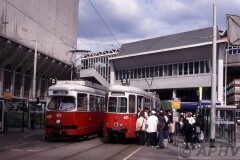 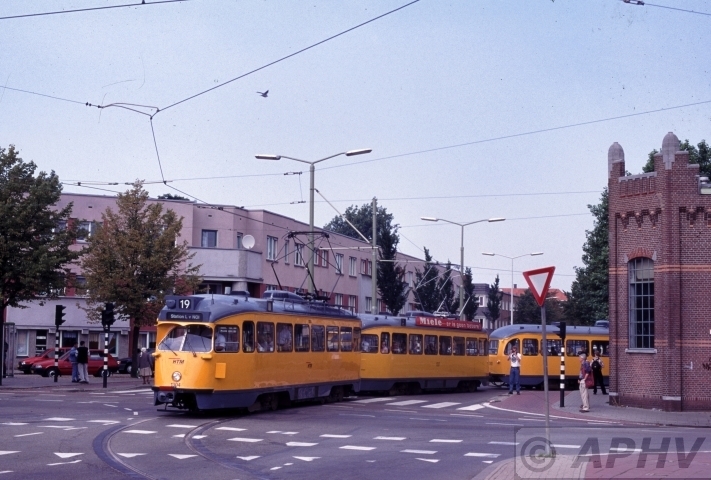 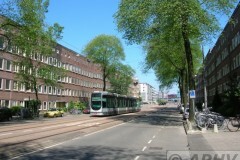 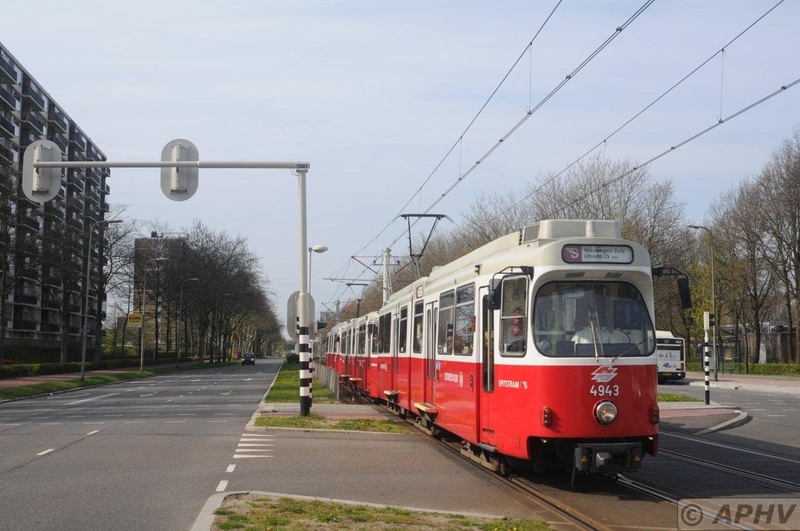 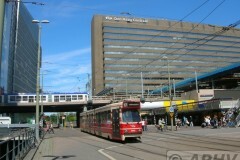 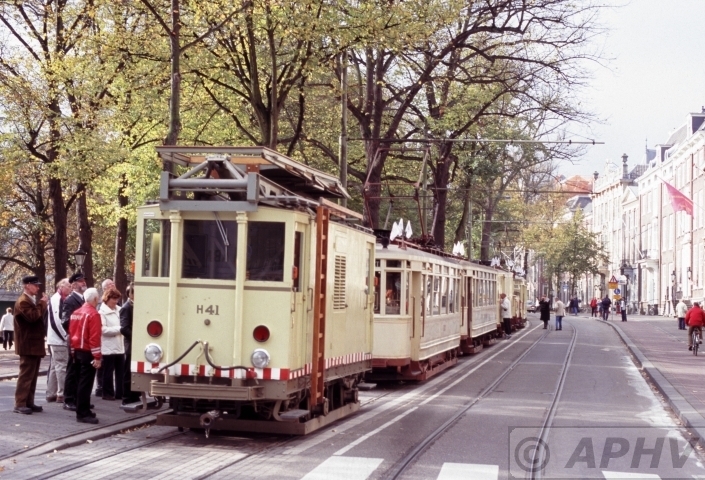 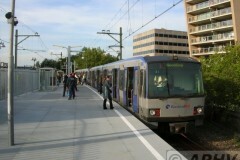 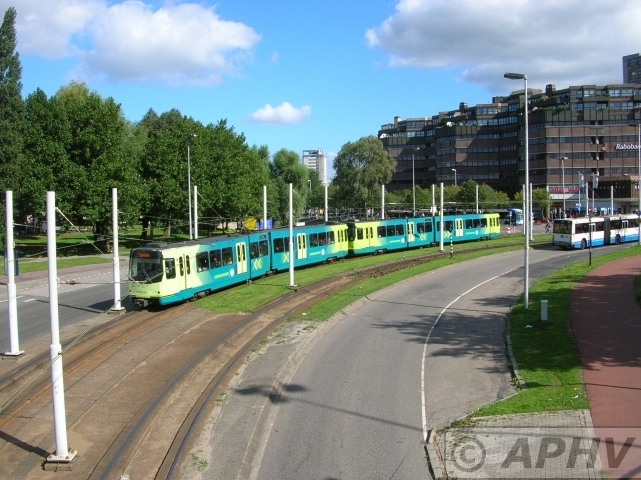 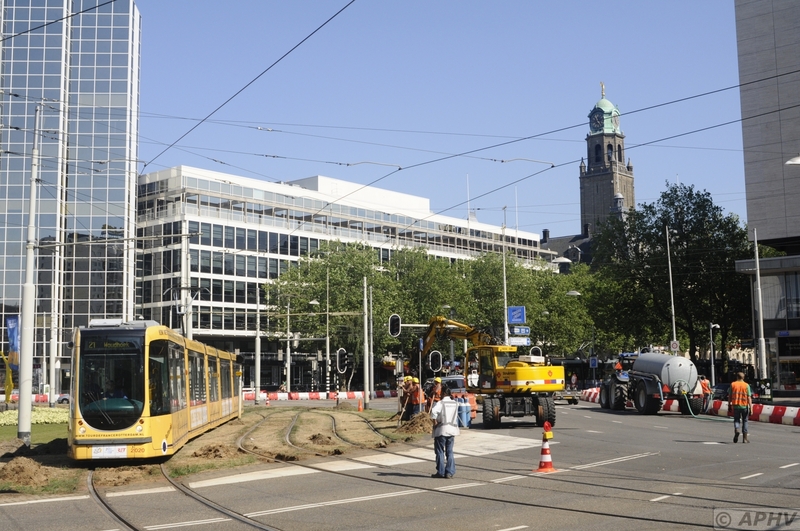 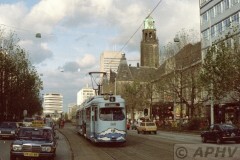 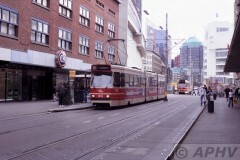 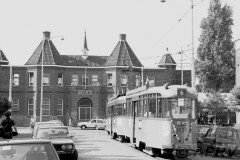 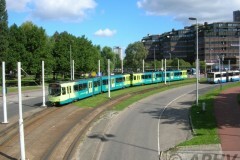 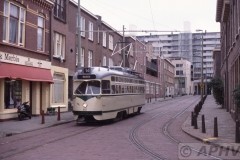 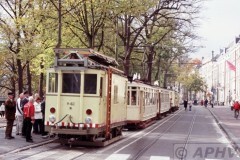 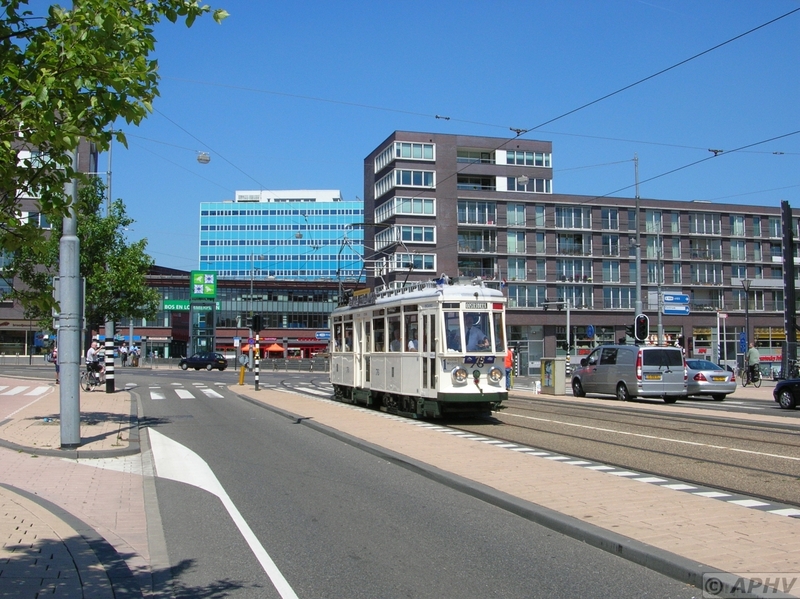 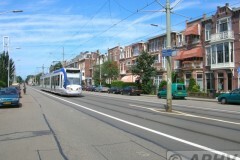 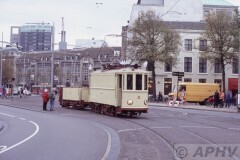 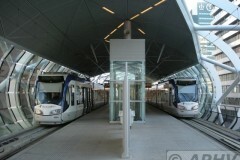 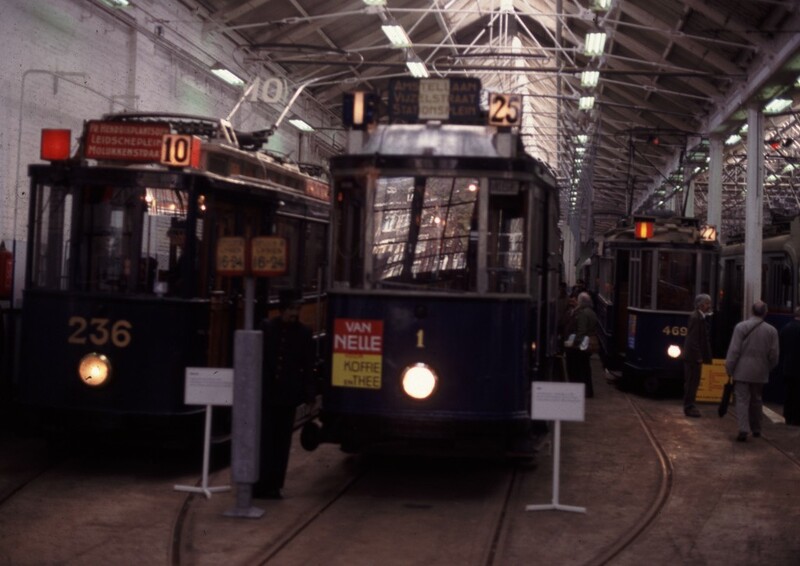 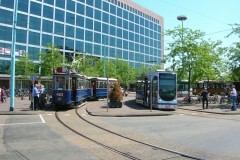 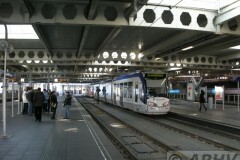 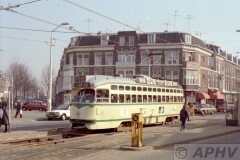 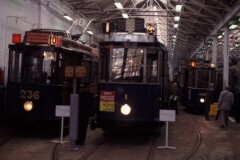 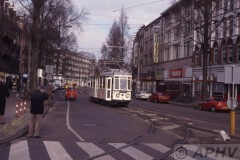 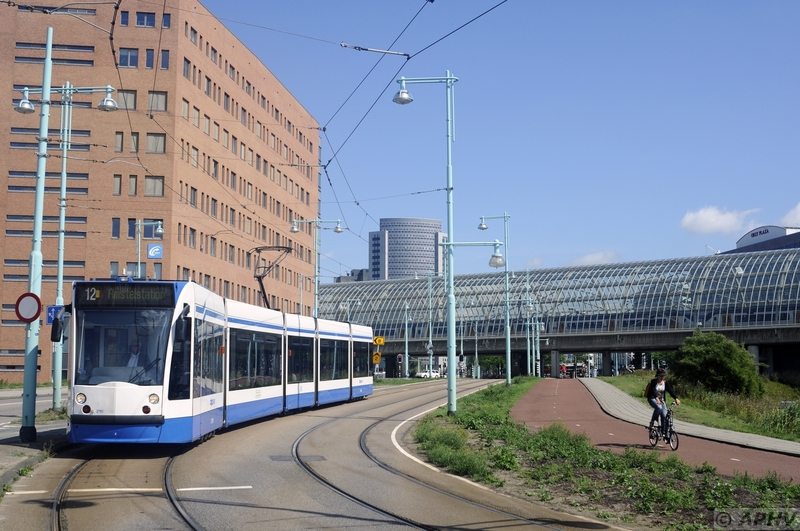 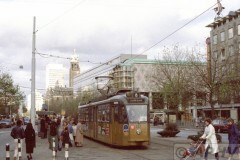 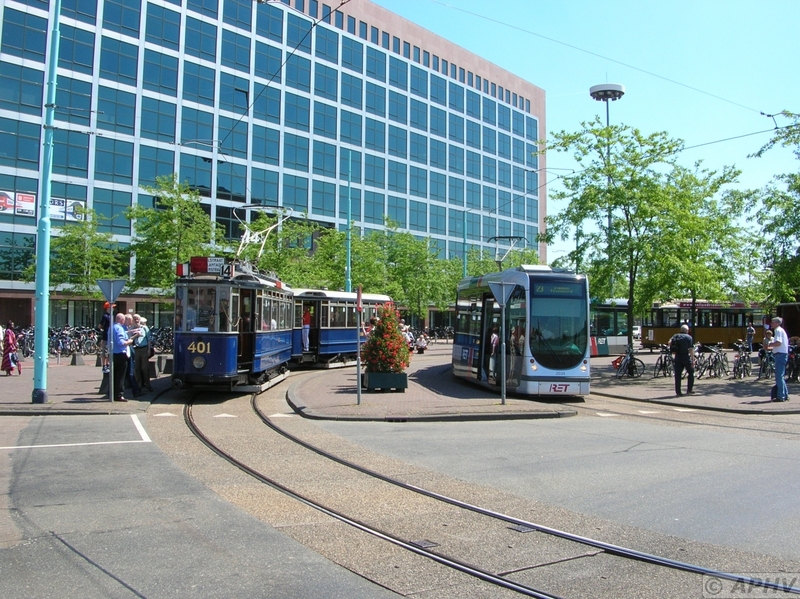 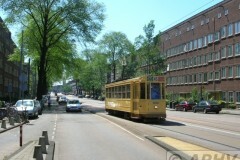 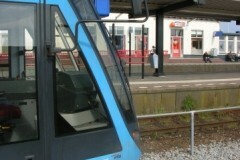 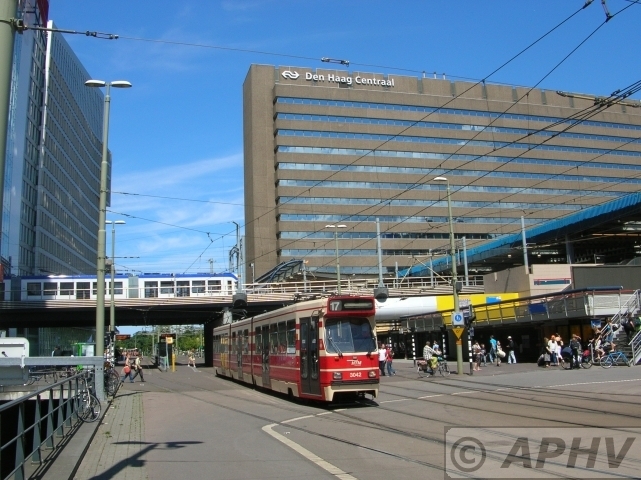 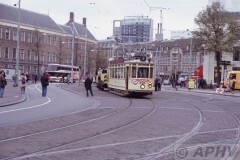 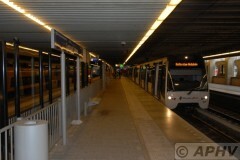 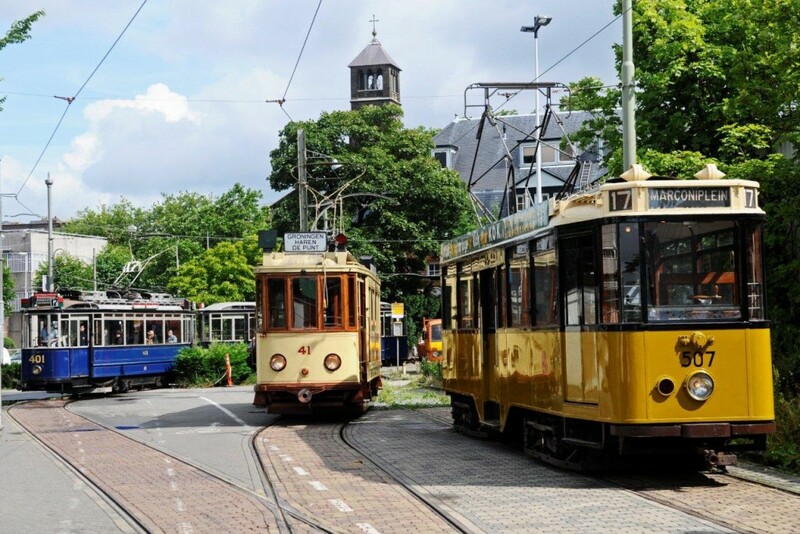 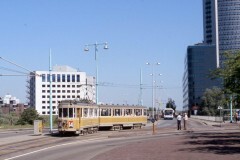 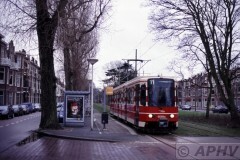 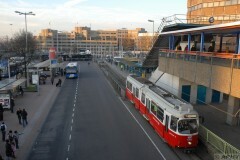 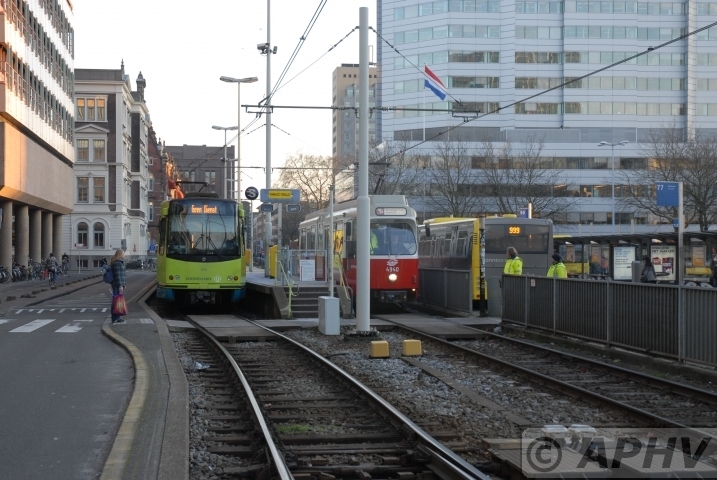 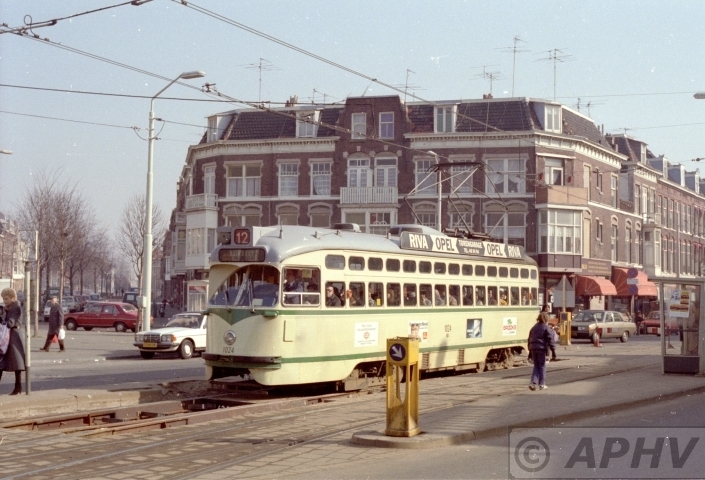 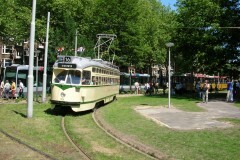 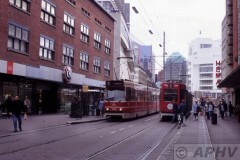 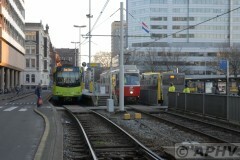 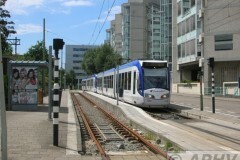 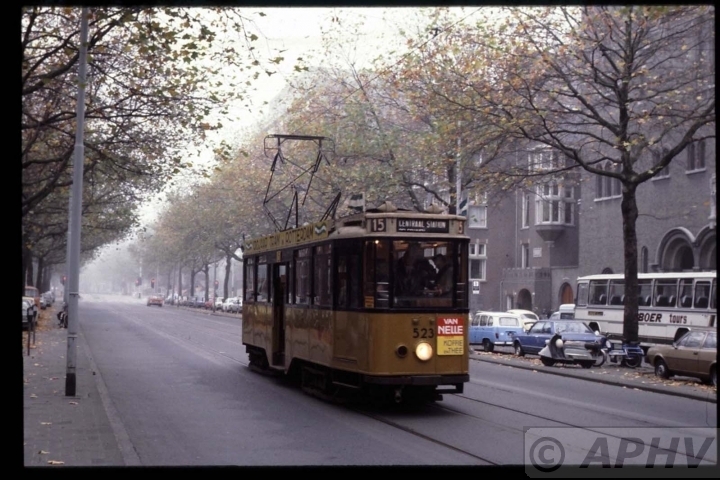 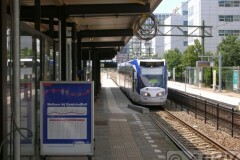 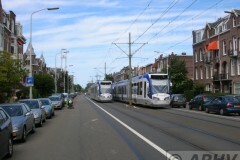 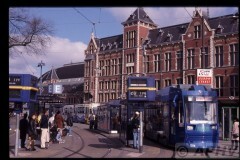 Although PCC’s in Den Haag never were used in 3 car formations the cars are capable off doing so. 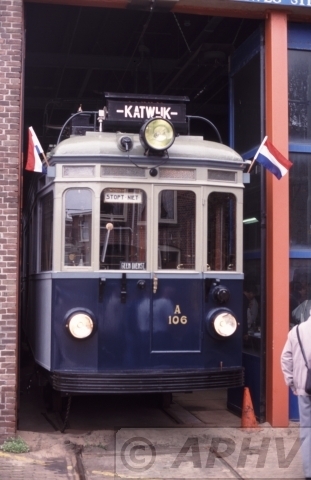 6 November 2002 at Scheveningen Pekel depot (former Salt depot) almost ready after a long restauration NZH A106 is waiting for its truck to be completed. 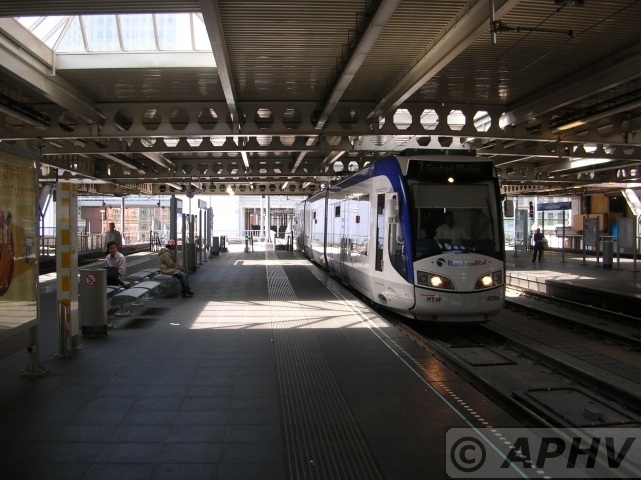 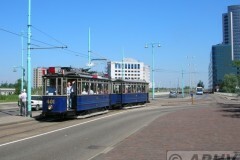 6 November 2002 NZH A327 and trailer B303 Duinstraat on route 11 at Scheveningen. 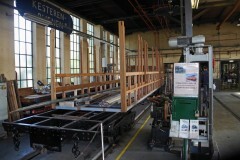 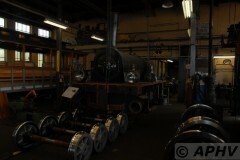 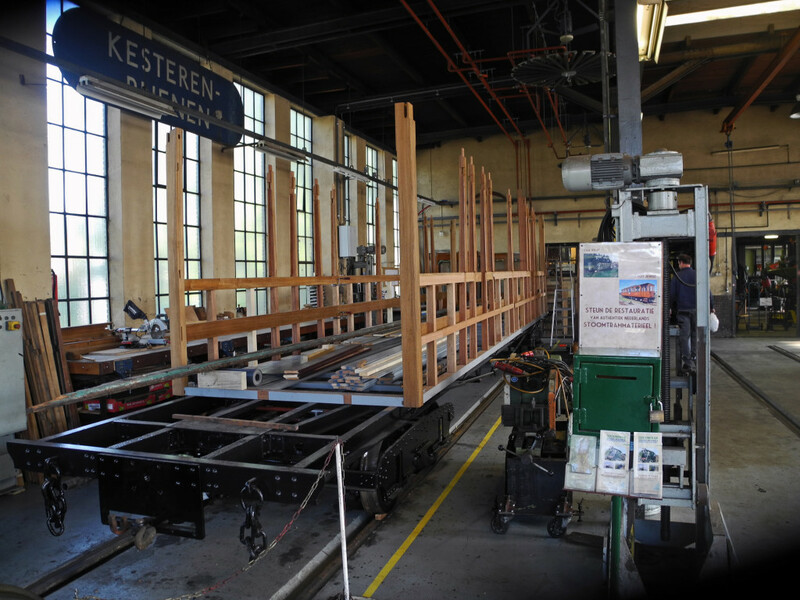 Hoorn the loco shed and main workshop with Chiemsee loc and NSM RSTM 2 being the oldest excisting tramway locomotive in this country. 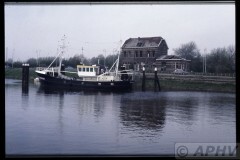 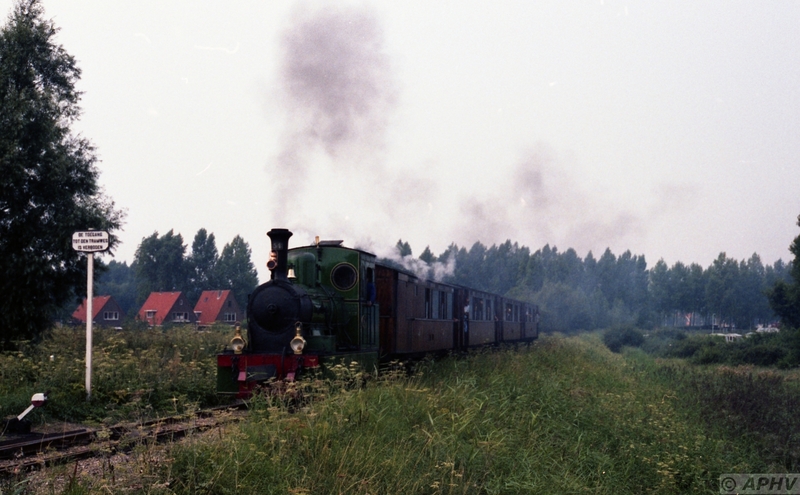 Wognum – Nibbixwoud loc 30 and 16 with Medemblik – Hoorn passenger. Hellevoetsluis 1977 The old RTM station building fallen into ruin shortly before being swapped away into history. 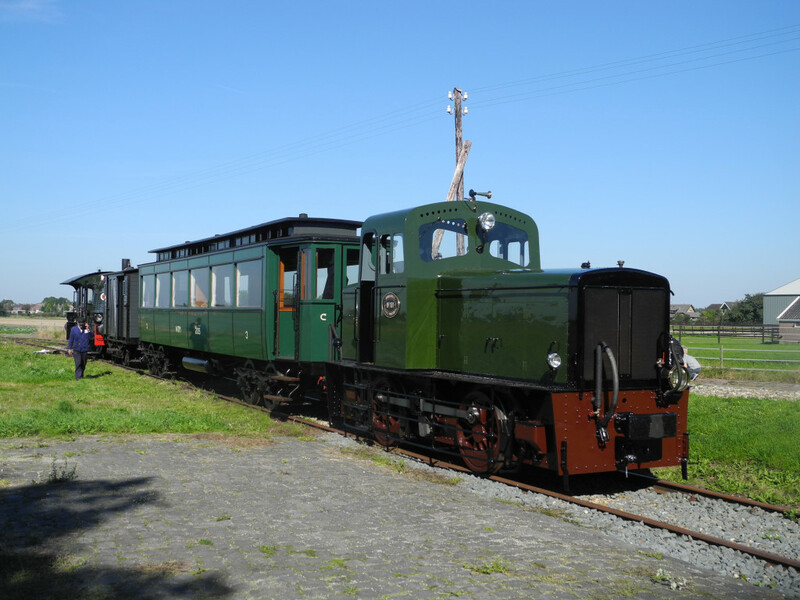 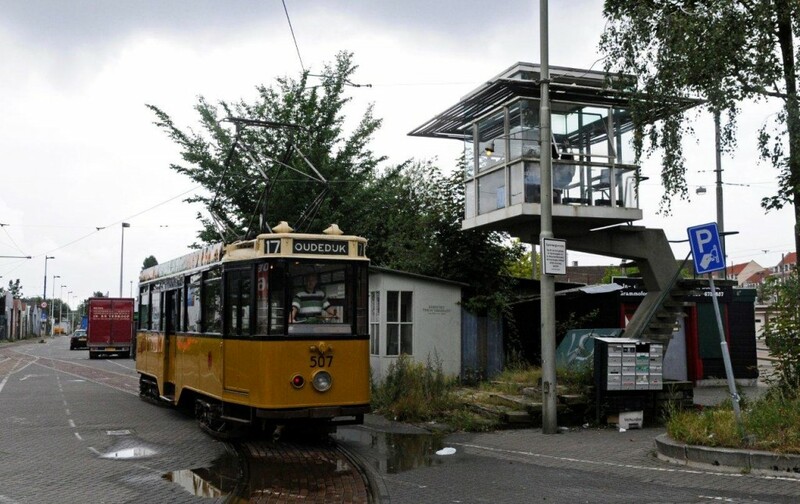 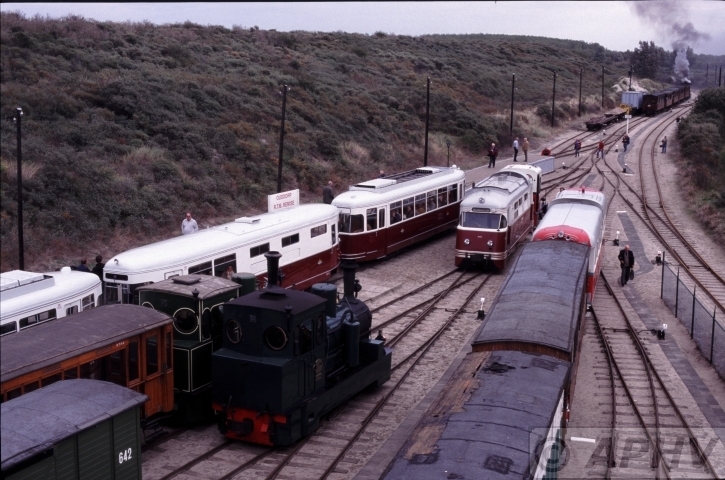 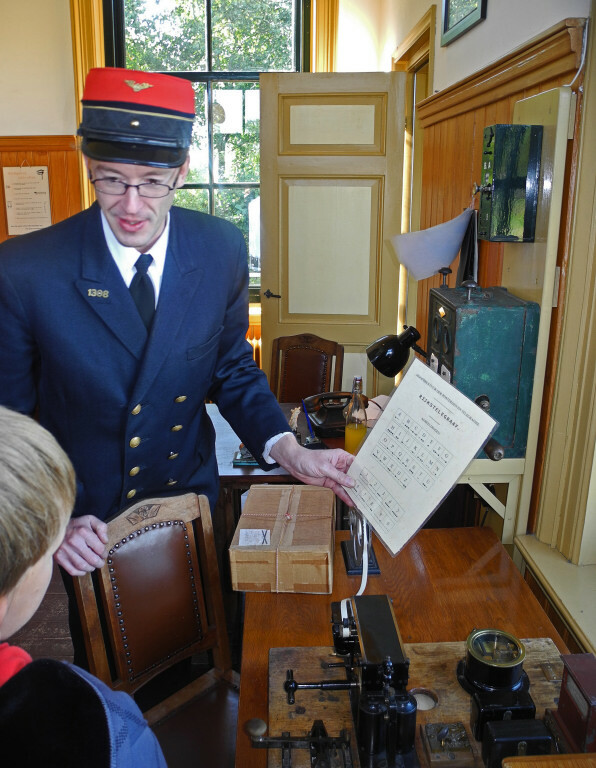 The local politicians never picked up the change to build a fine tourist attraction using the then museum tramline and some off the old tramway buildings. 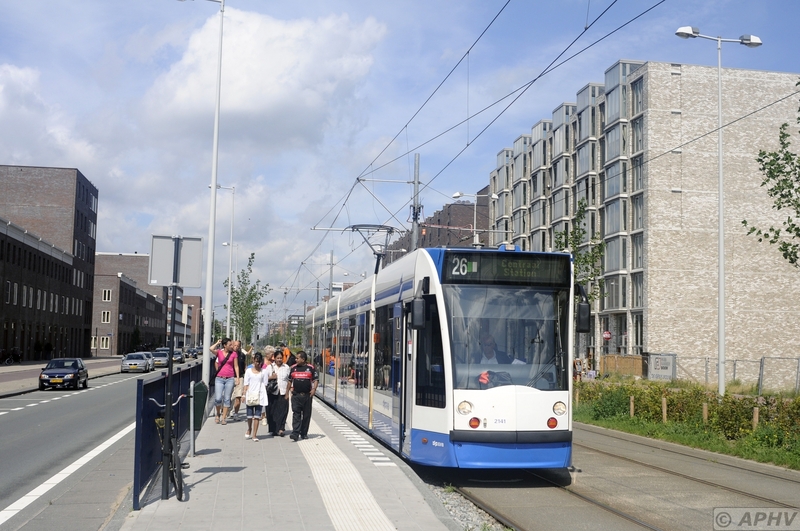 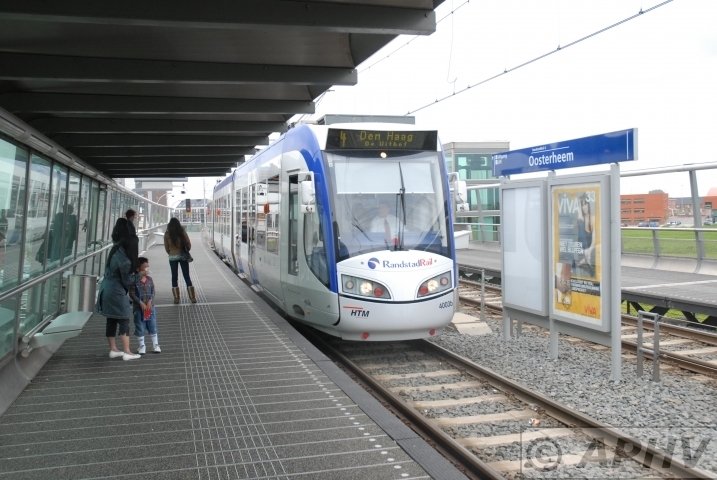 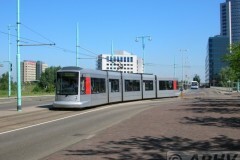 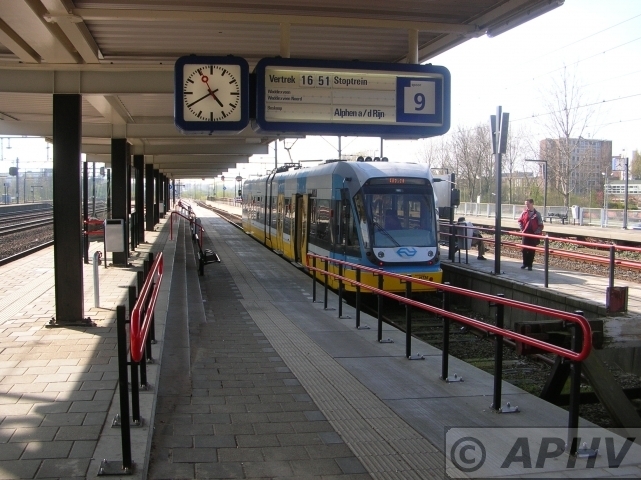 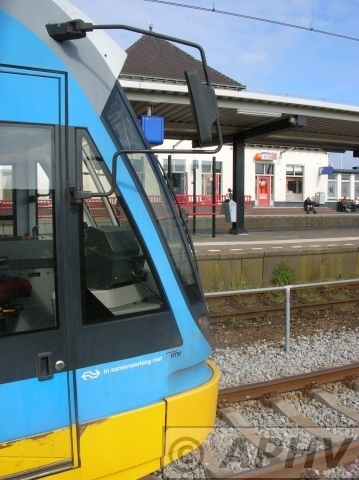 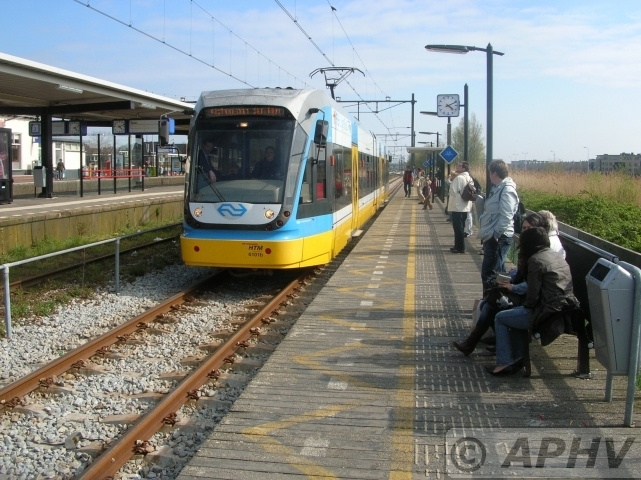 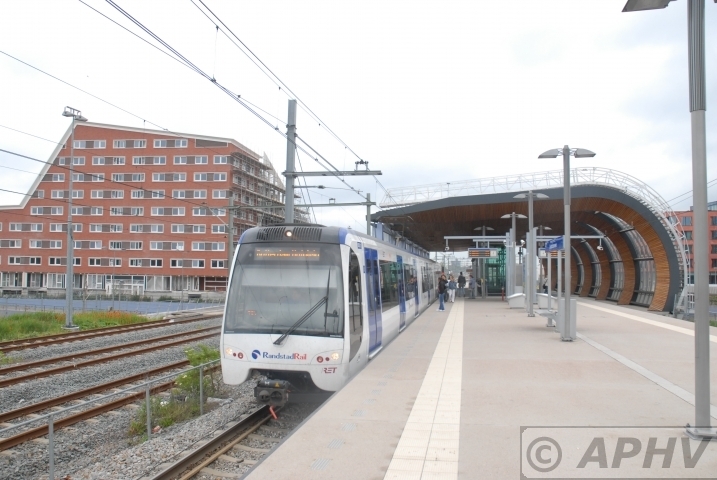 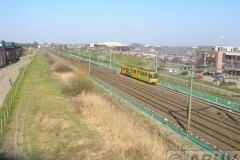 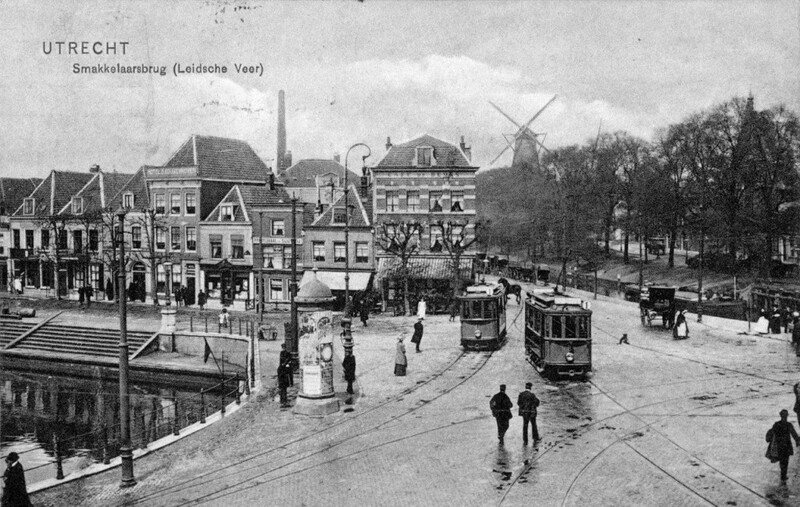 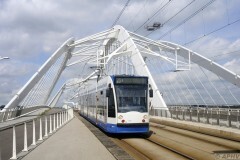 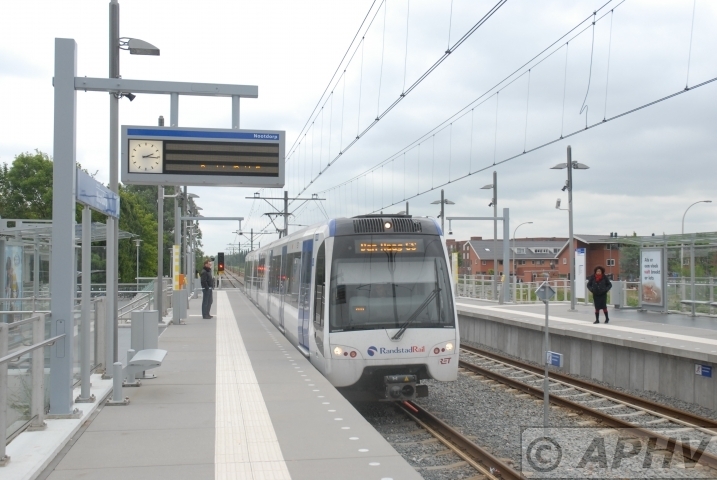 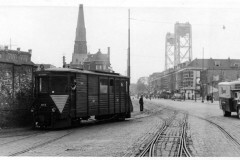 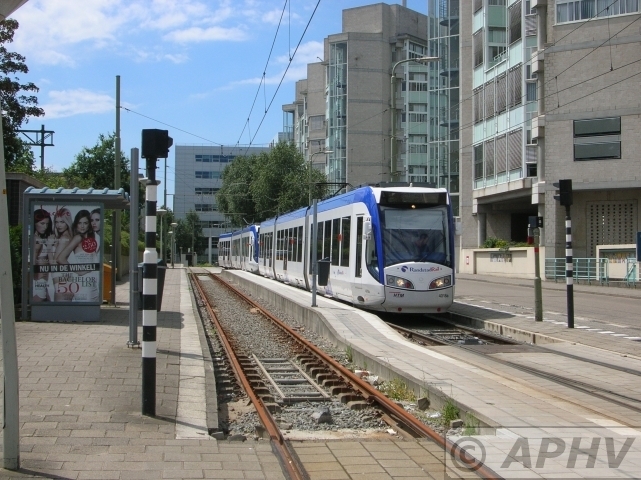 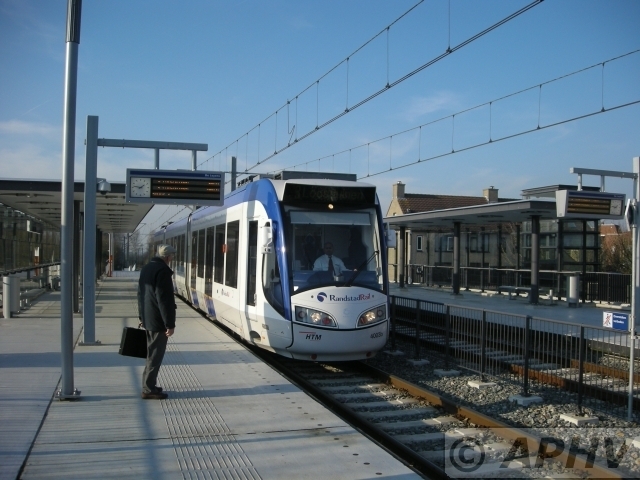 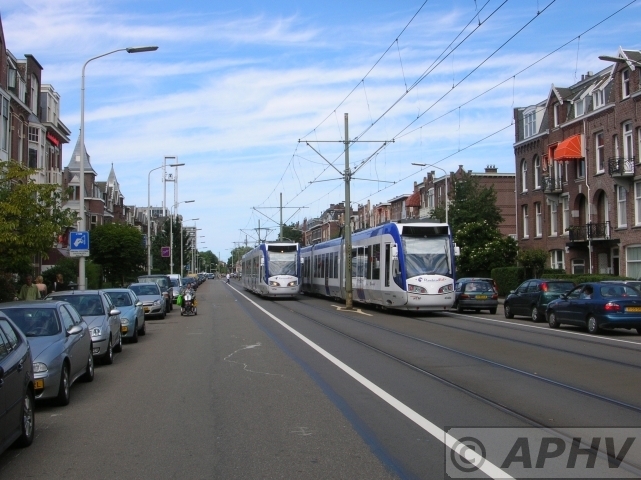 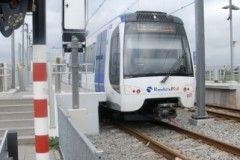 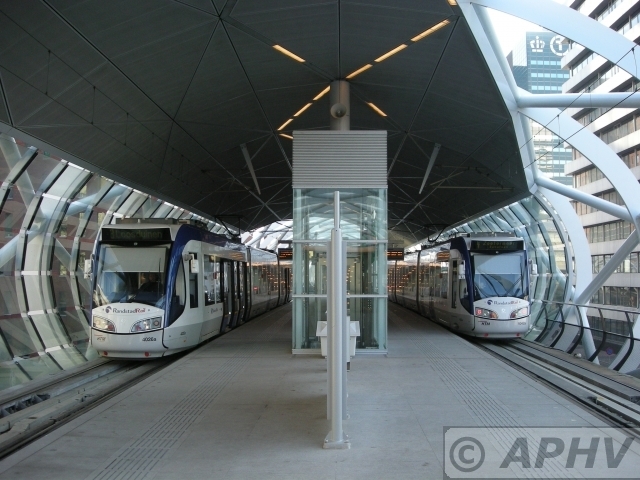 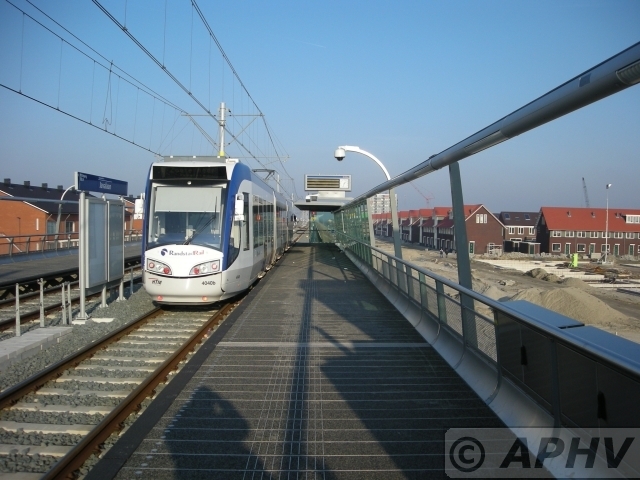 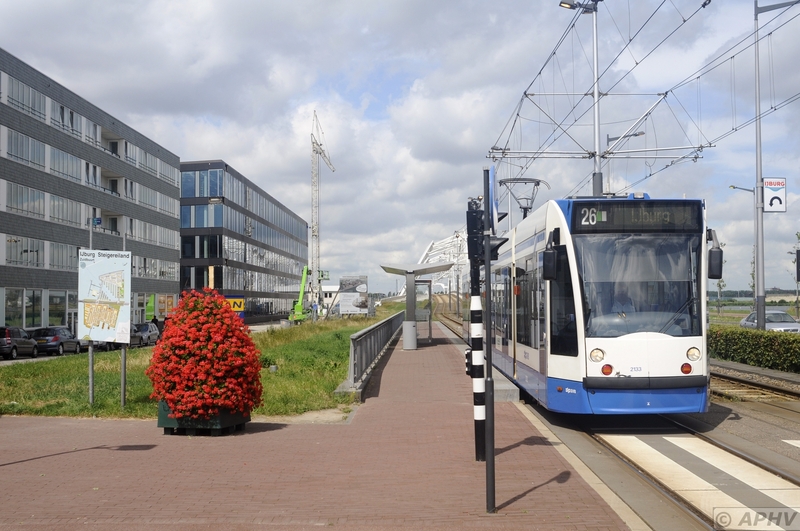 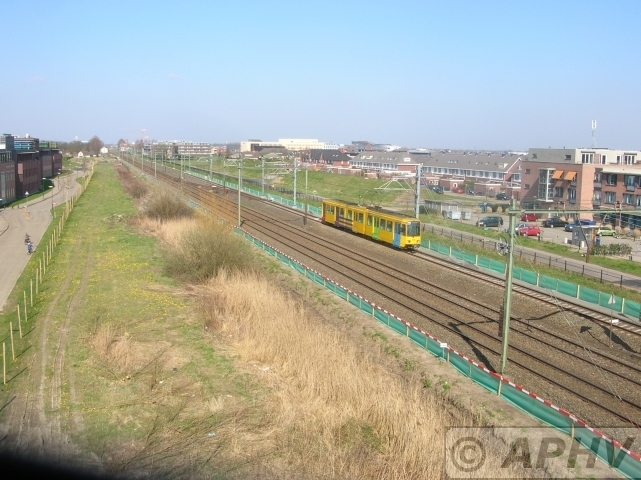 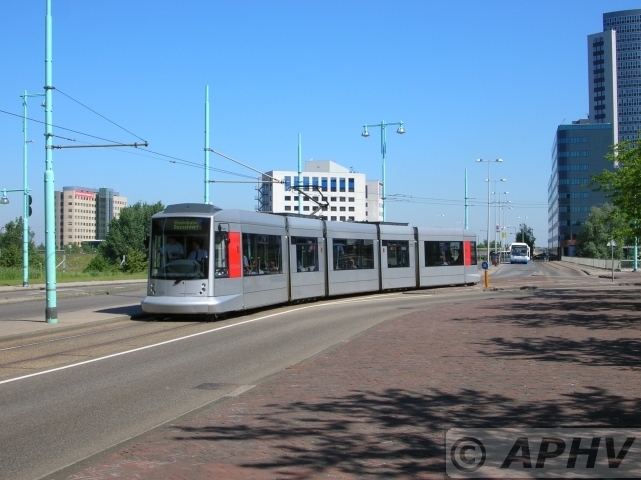 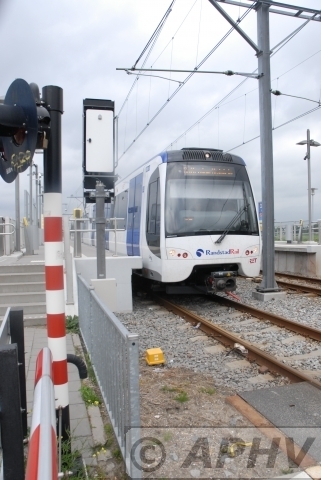 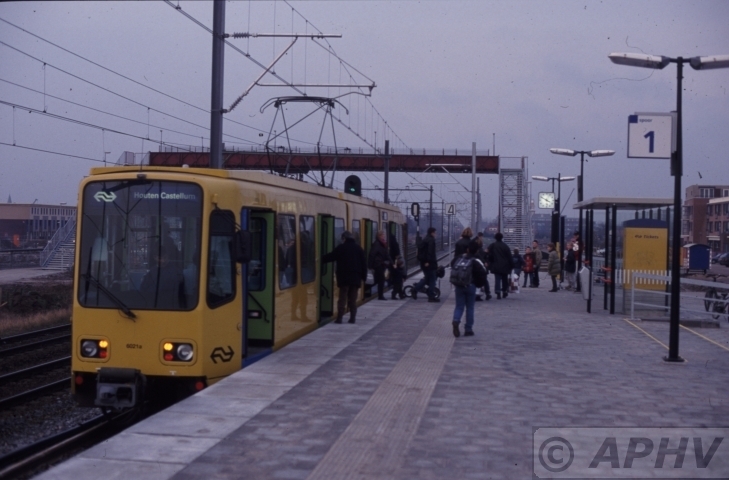 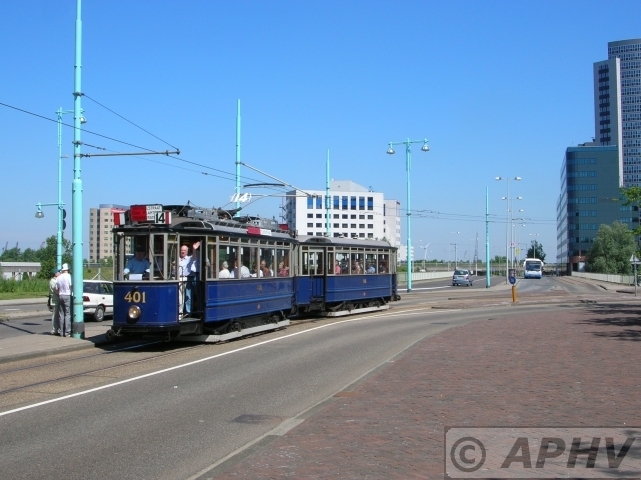 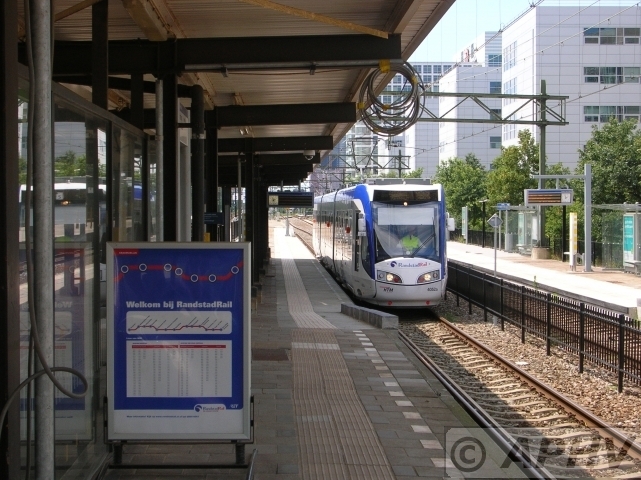 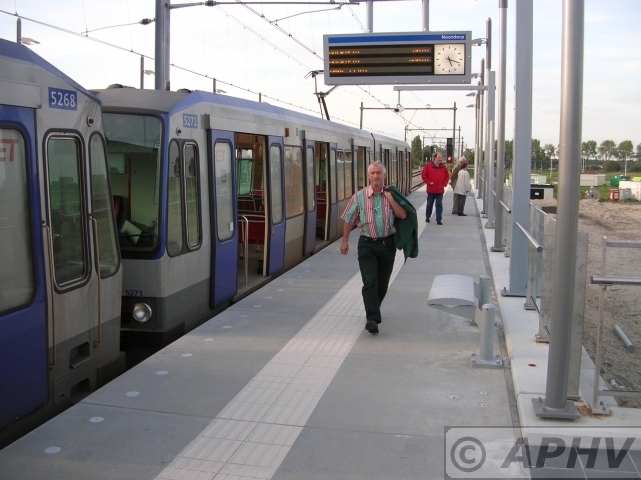 The tramroad between Spijkenisse and Hellevoetsluis was build strait as a railway line and never used for a hybrid vehicle like the Stadtbahn B-cars to connect Rotterdam with this fast growing suburb. 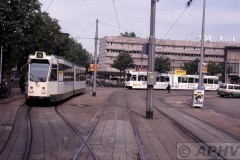 13 July 2004 HTM 3018 line 9 and 3060 line 2 pick up their passengers. 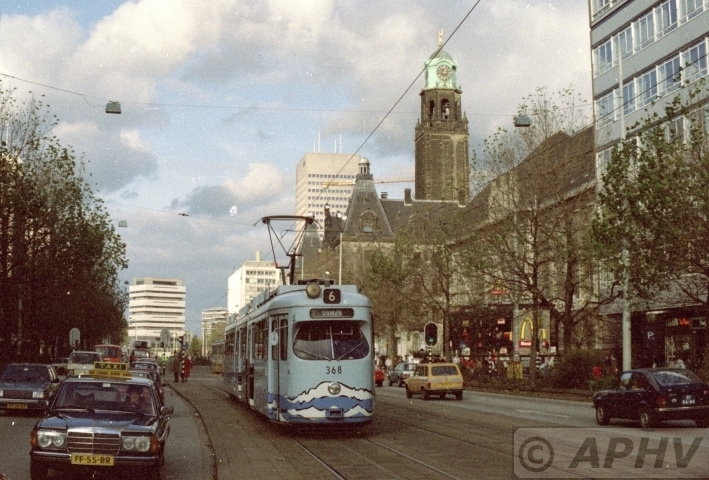 ‘s Gravenhage is the stylish old name for Den Haag. 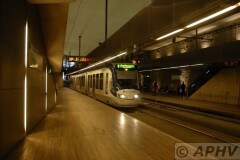 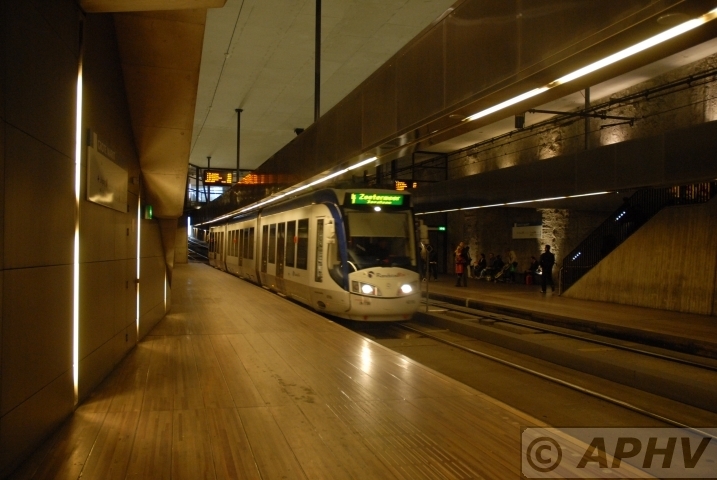 In the new tram tunnel I found out that funny clowns in securety uniforms forbid taking pictures! 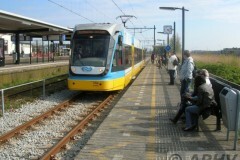 You need a HTM permit they cleam. 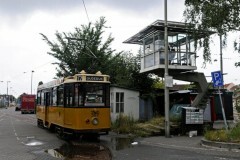 I never have heard a more stupid remark. 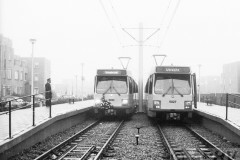 Even todays China is more friendly. 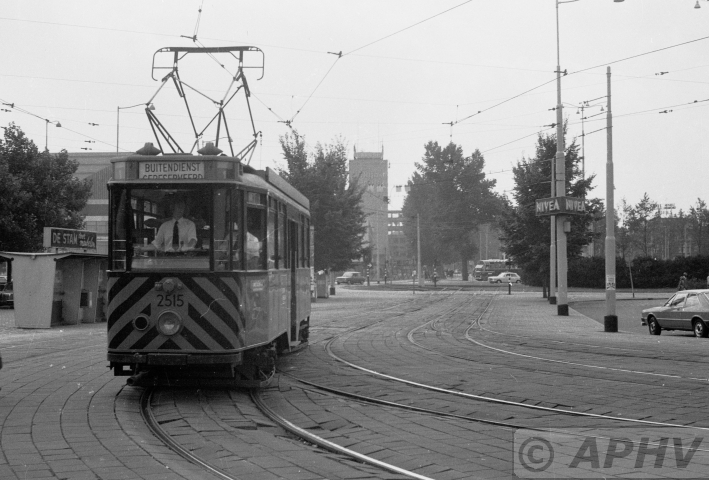 The trick for would be phtographers is to avoide long senseless discussions; arrive by tram, get out and go into position. 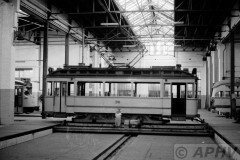 Then when the next car arrives take your photograph without flash and get into the just arrived car and leave. 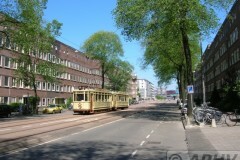 Gluck Auf. 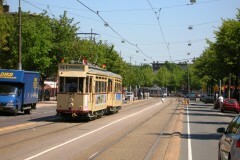 Just a few more days to go. 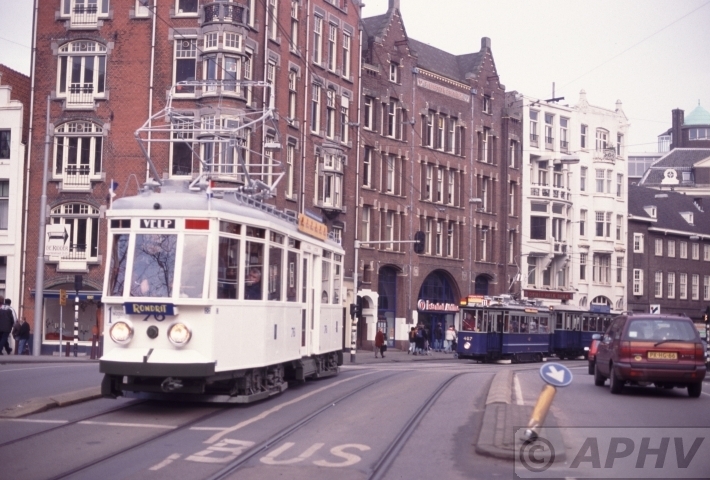 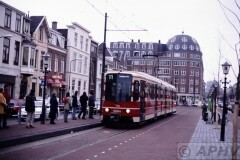 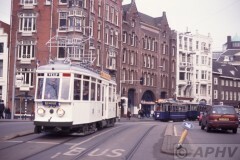 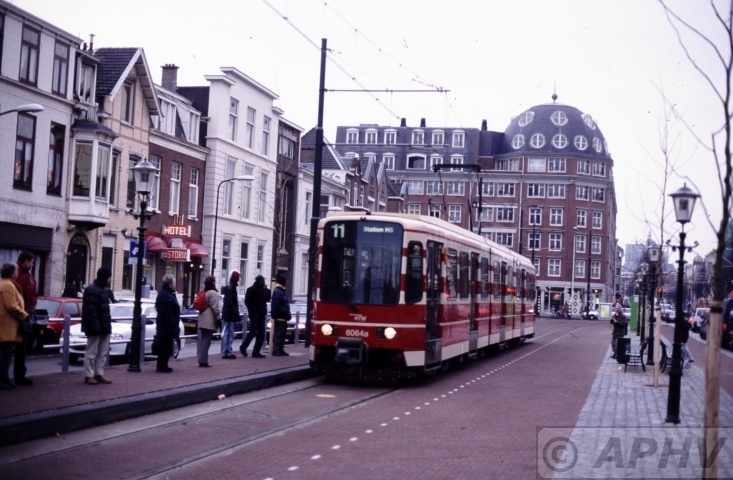 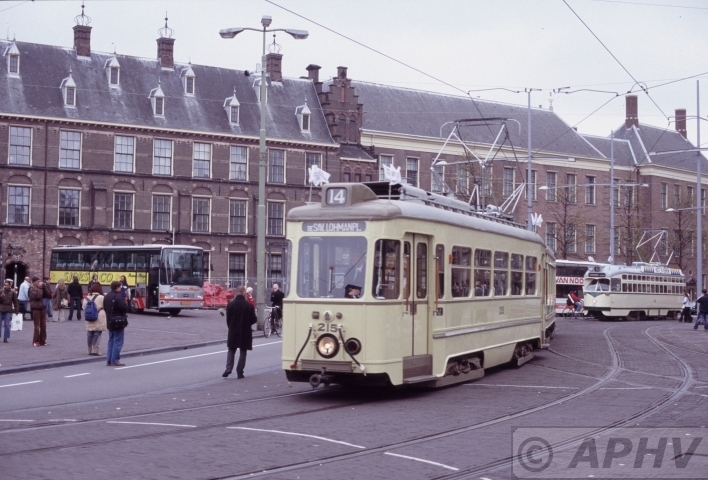 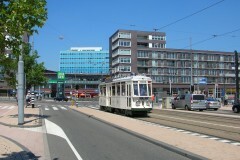 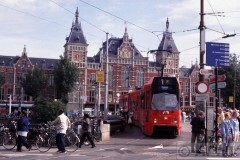 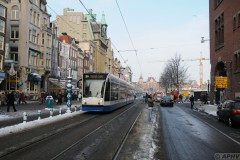 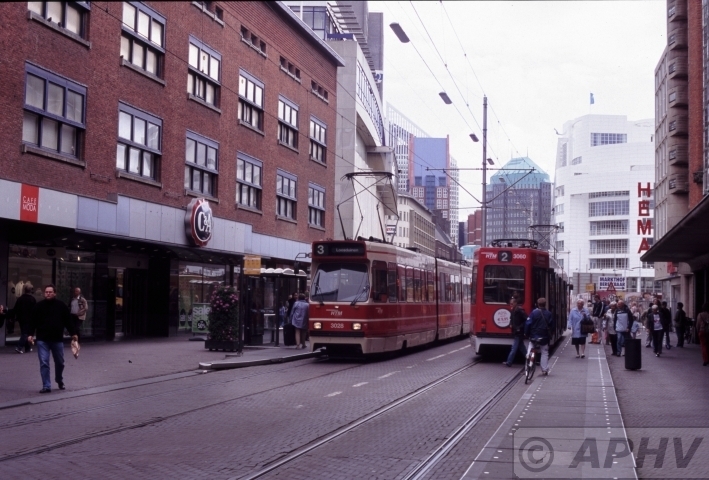 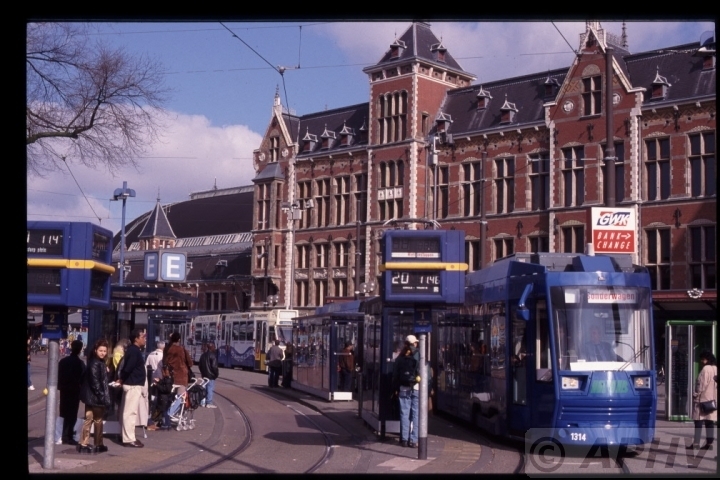 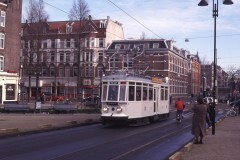 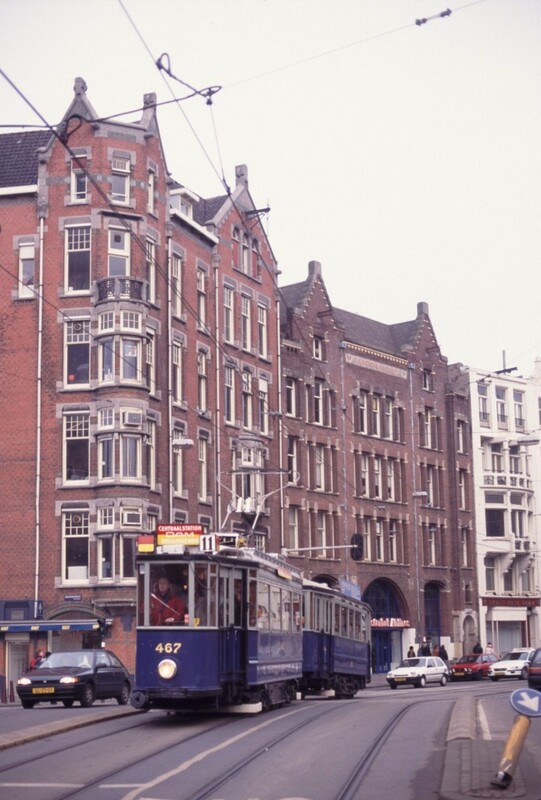 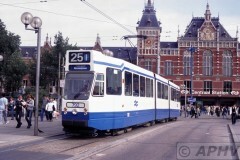 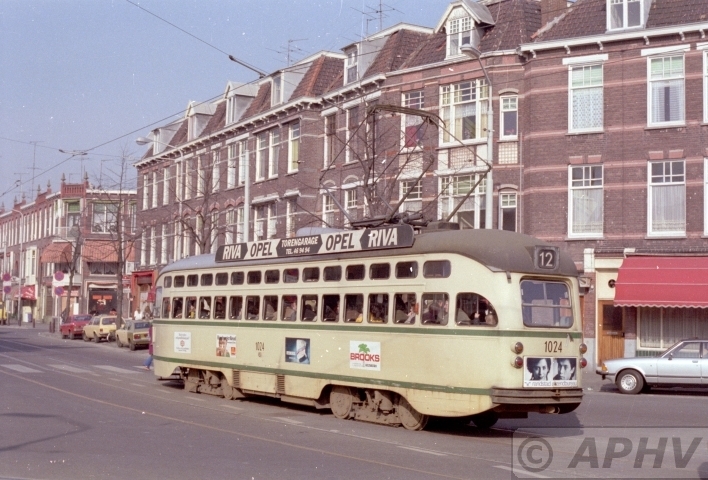 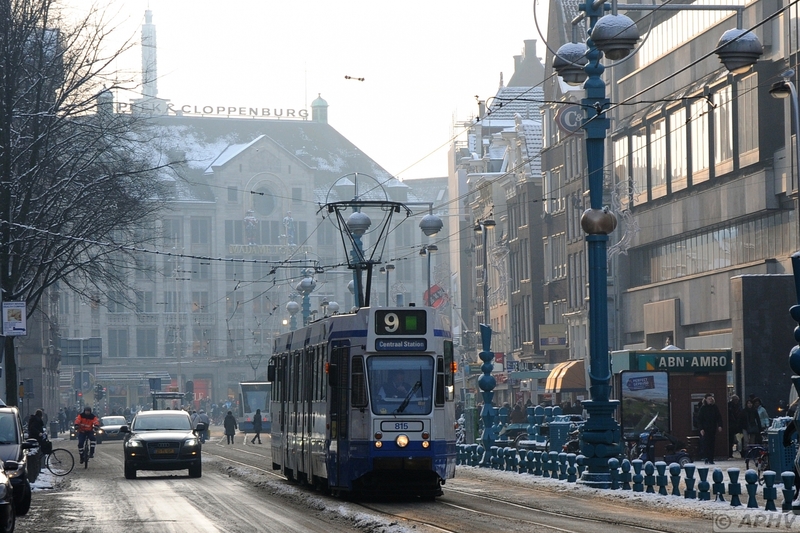 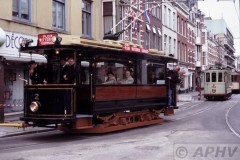 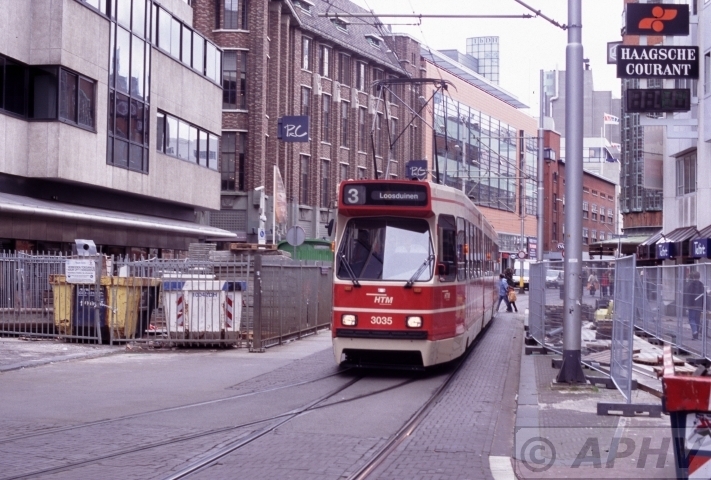 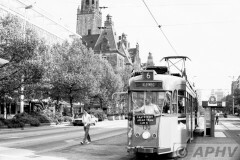 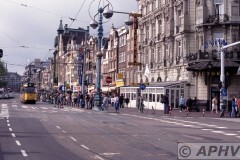 Car 756 on line 4 Damrak towards Centraal Station. 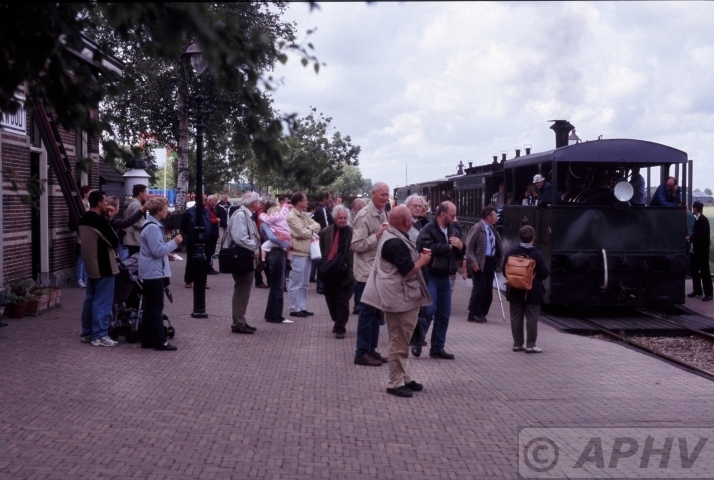 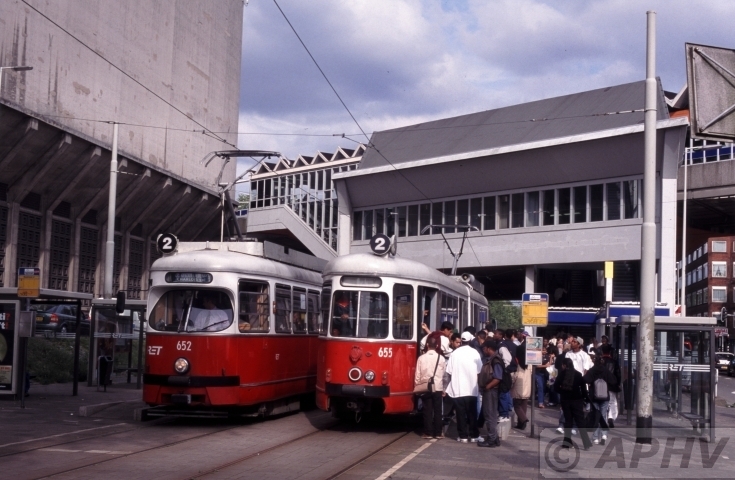 28 March 1999 Magdeburg 1314 on a Sunday morning fantrip at Centraal Station. 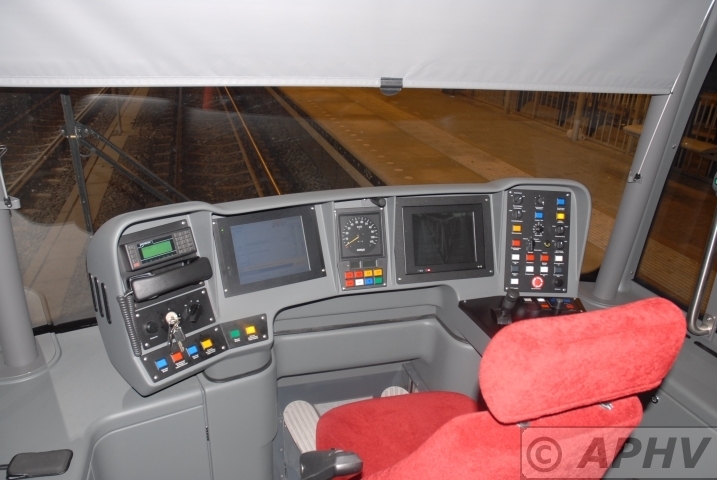 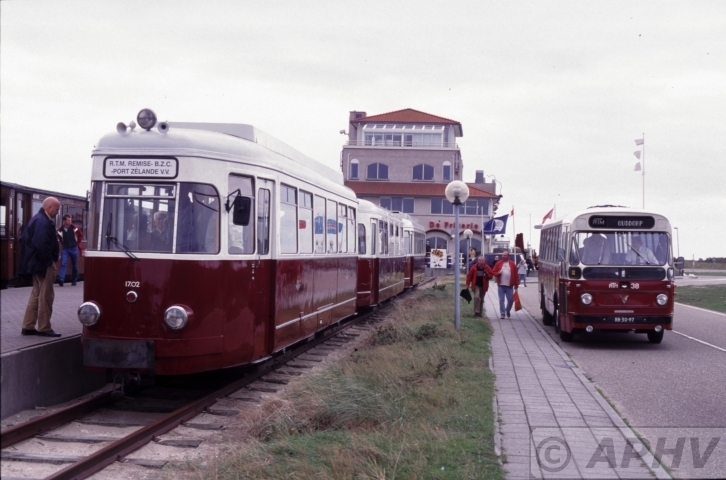 Personally I did like these cars much more that the Combino from Siemens. It had a more quiet run and better interior. 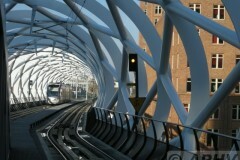 GVBA 792 on line 25 leaving Centraal Station. 19 August 1975 Den Haag HTM1100 at Laan van Nieuw Oostindie terminus line3. 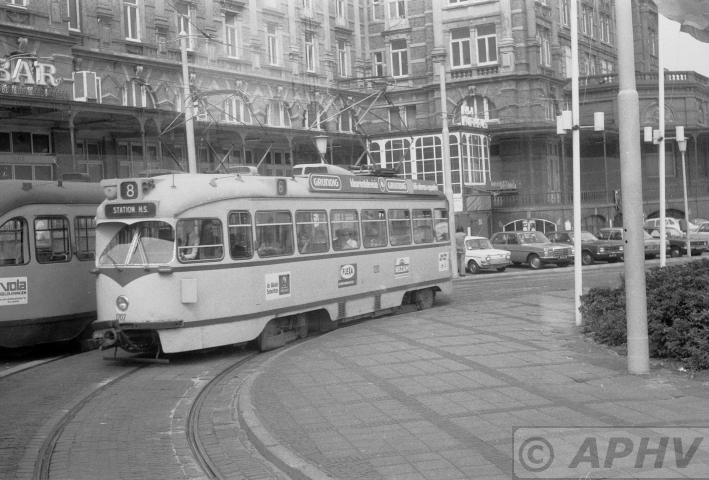 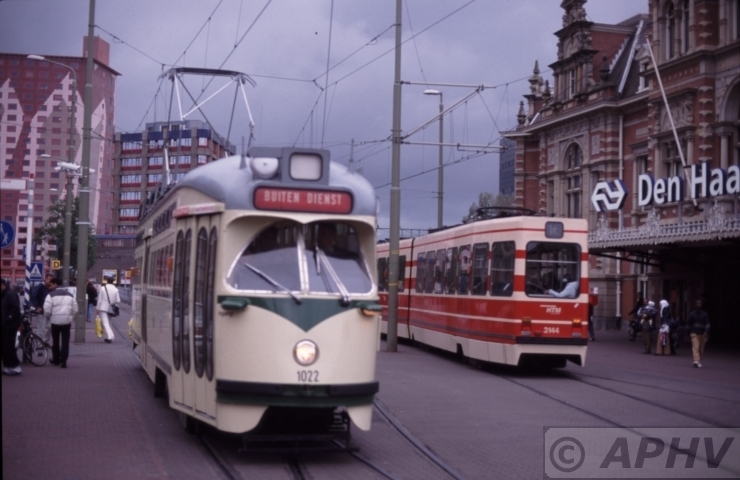 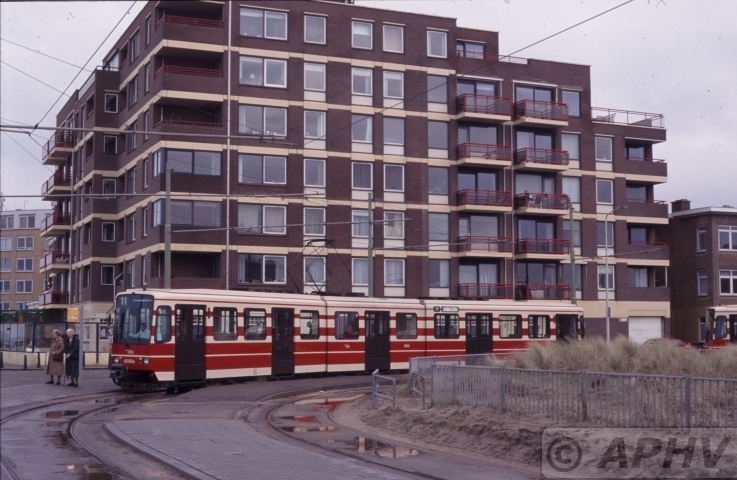 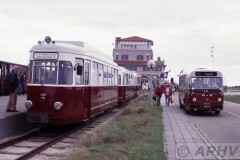 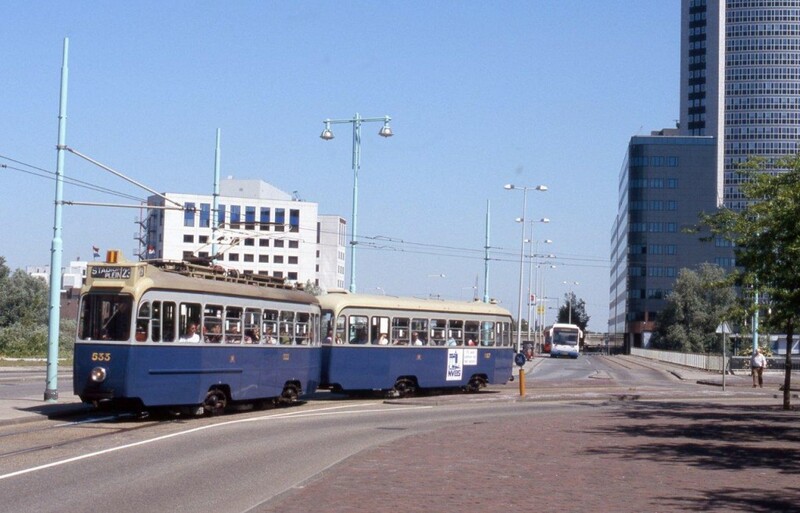 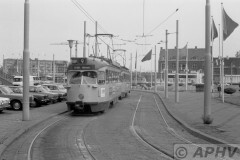 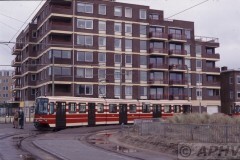 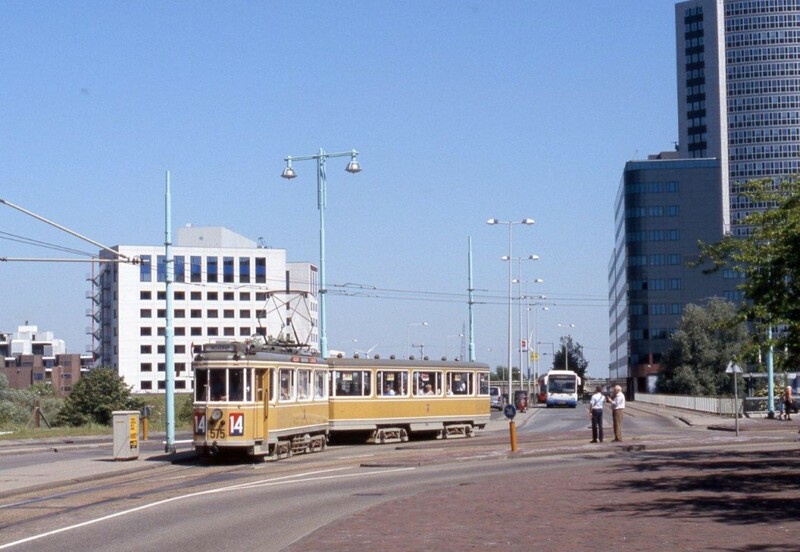 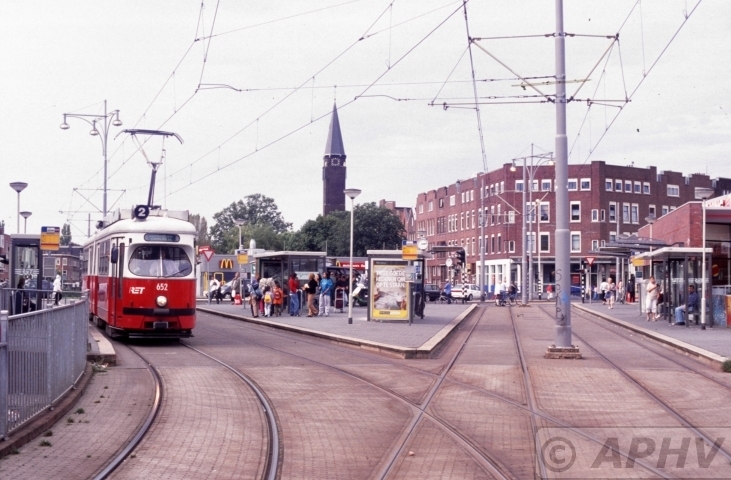 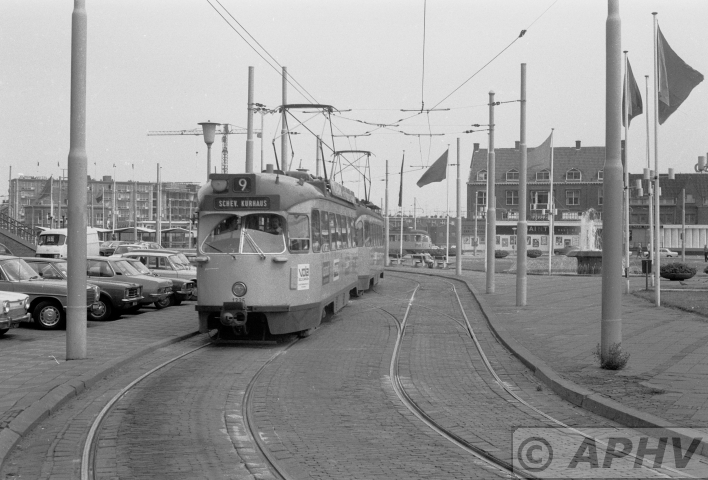 19 August 1975 Den Haag HTM1321 and driverless motor 2111 and line 11 terminus Scheveningen Strandweg. 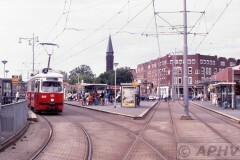 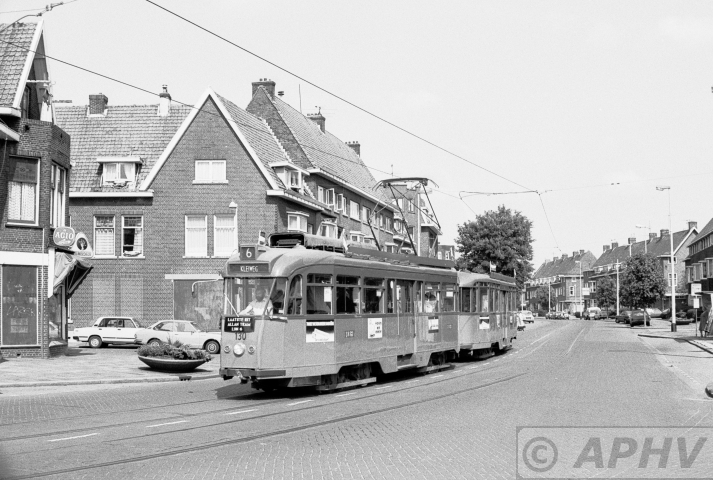 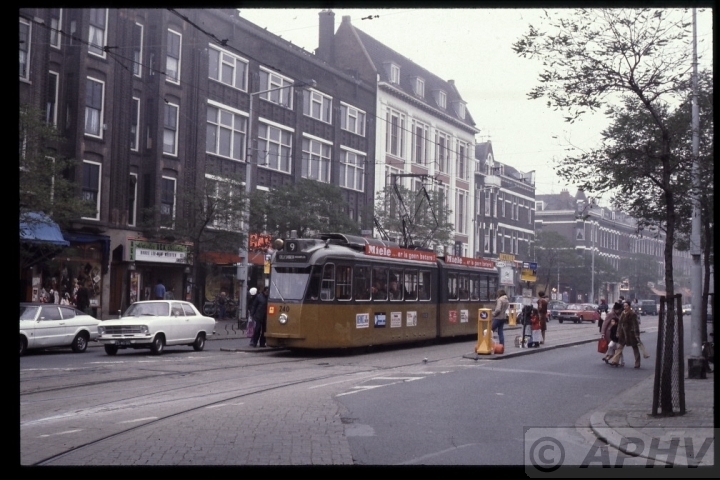 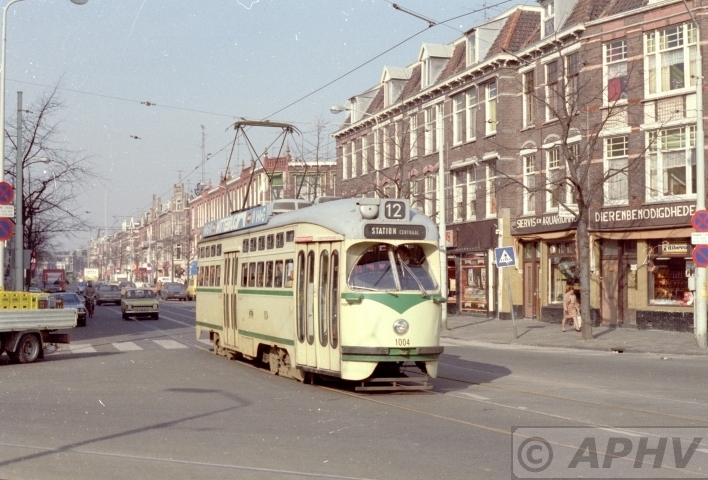 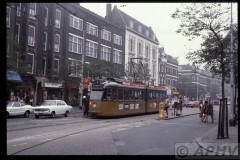 19 August 1975 Den Haag HTM1202 line 8 Kurhaus or Gevers Deijnootplein.